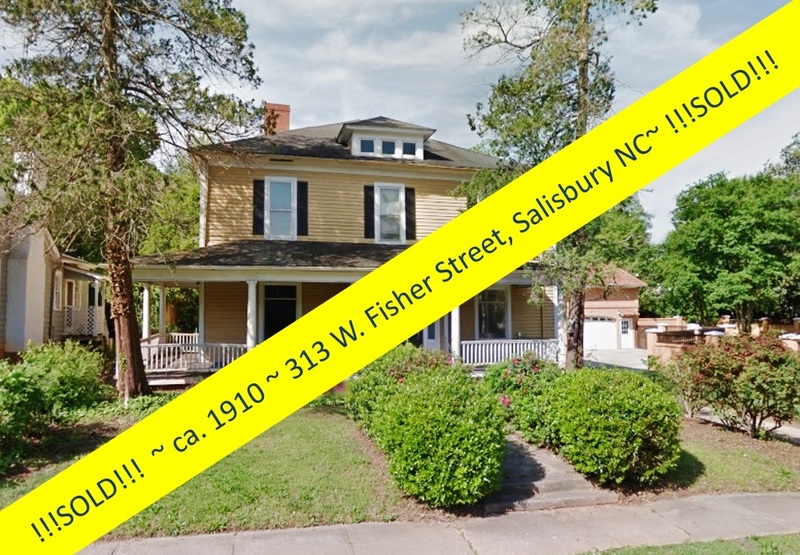 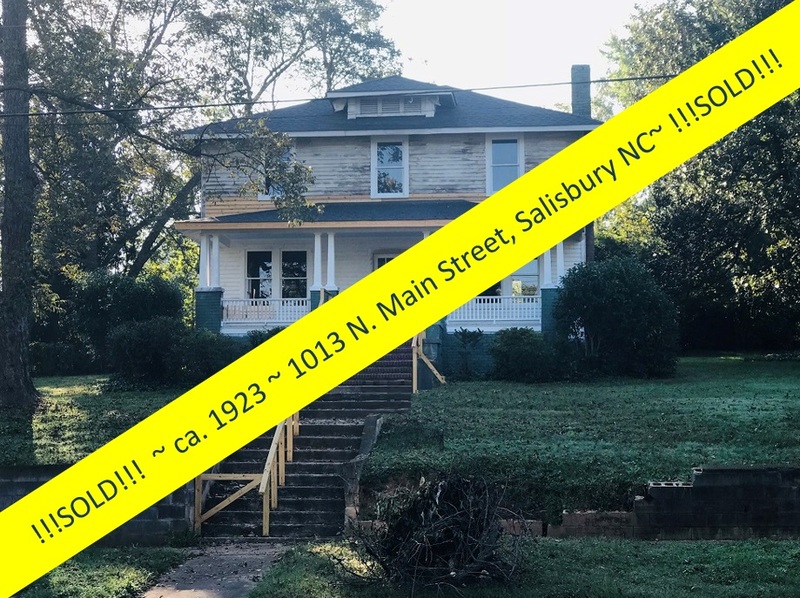 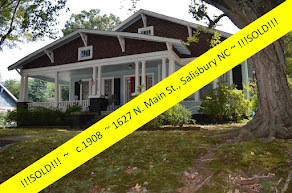 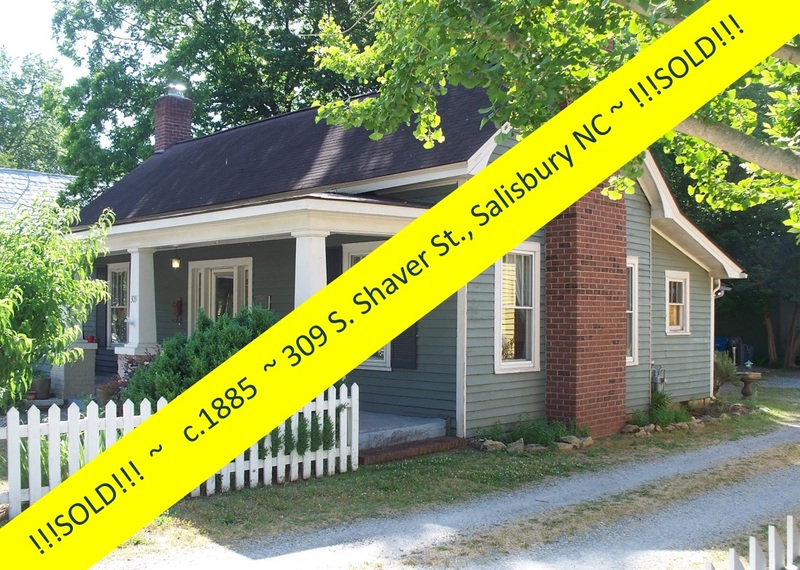 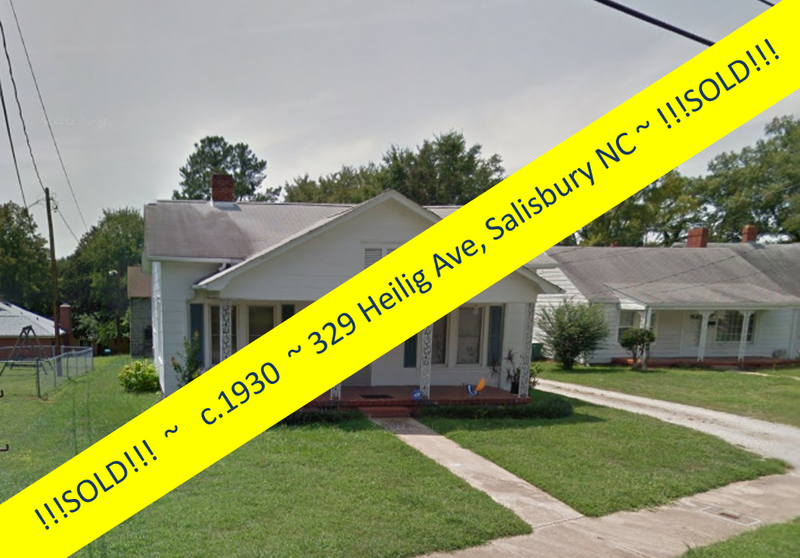 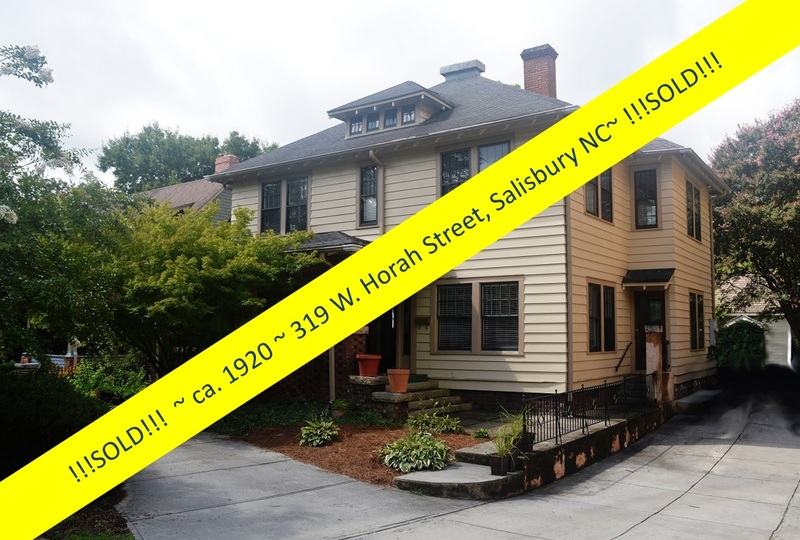 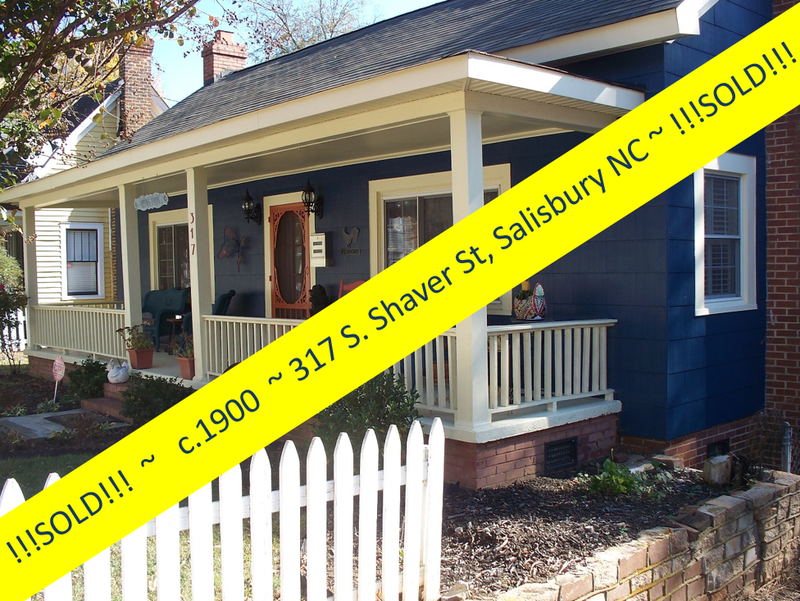 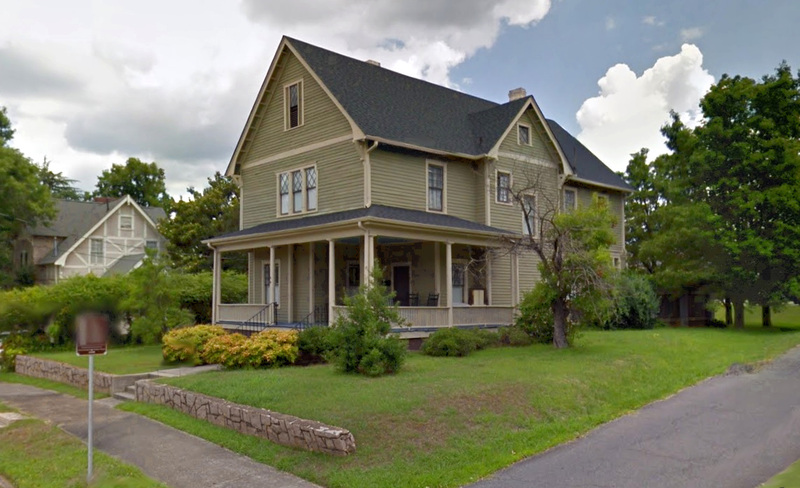 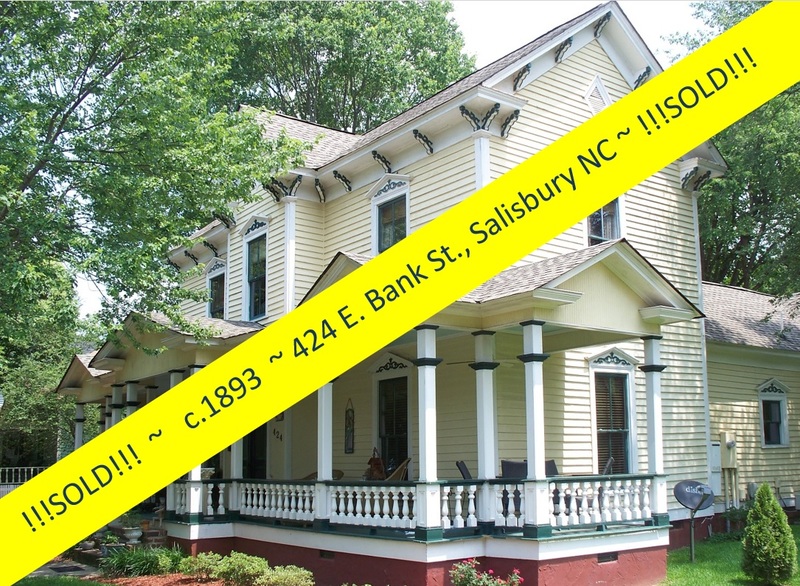 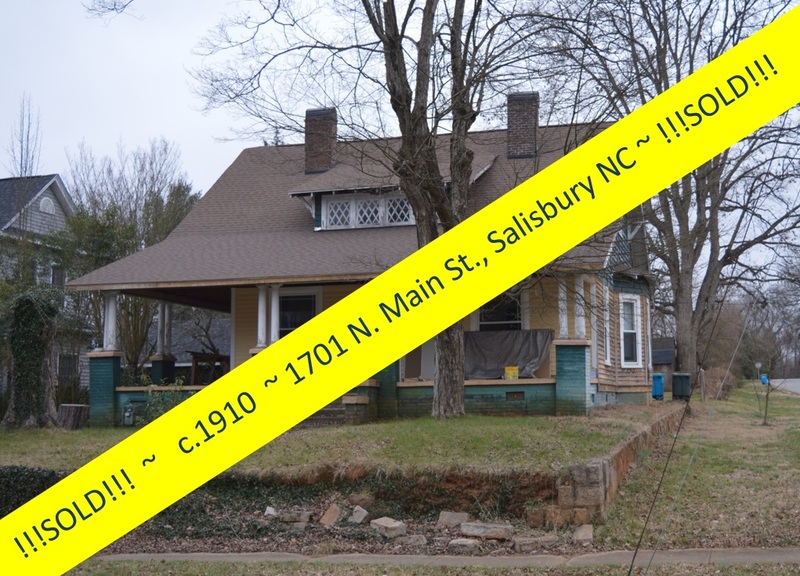 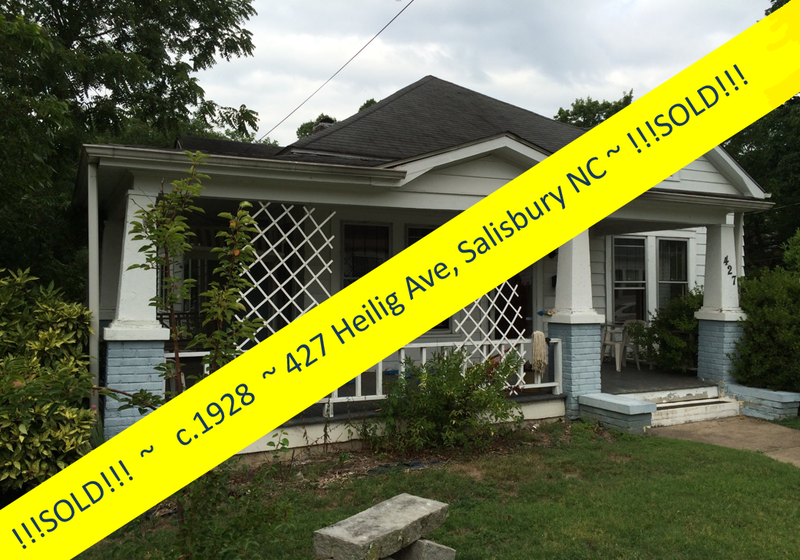 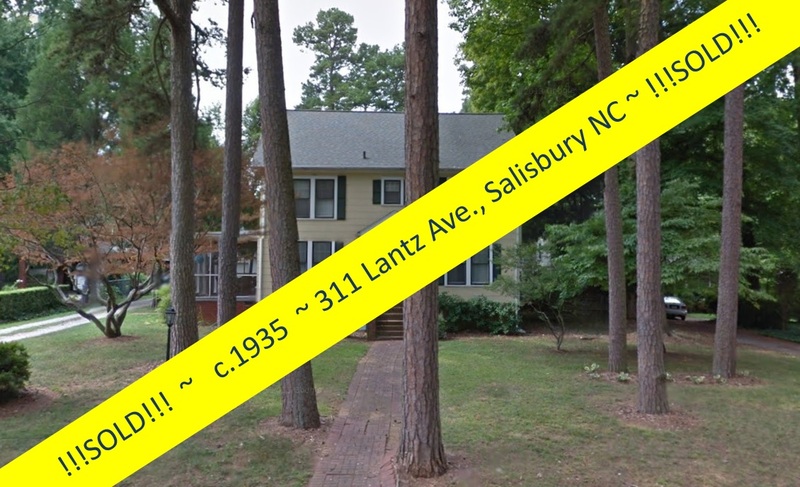 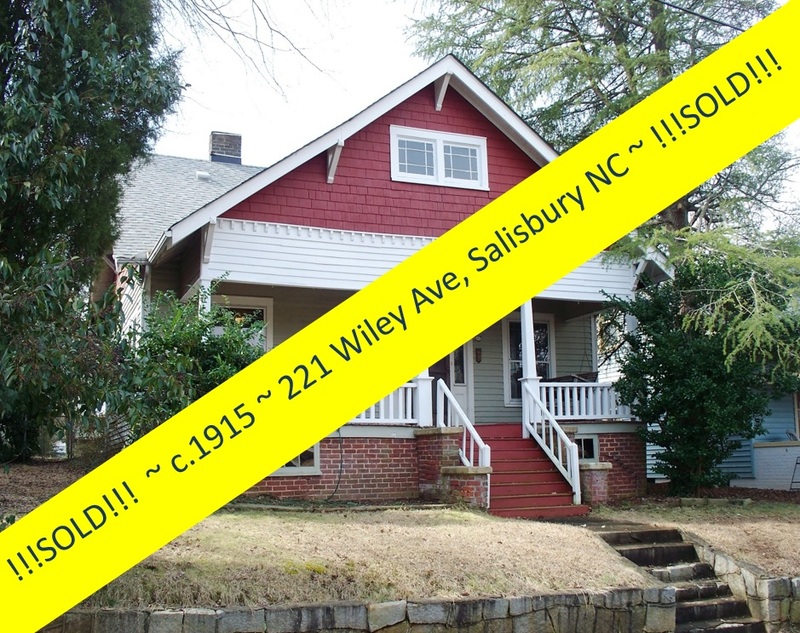 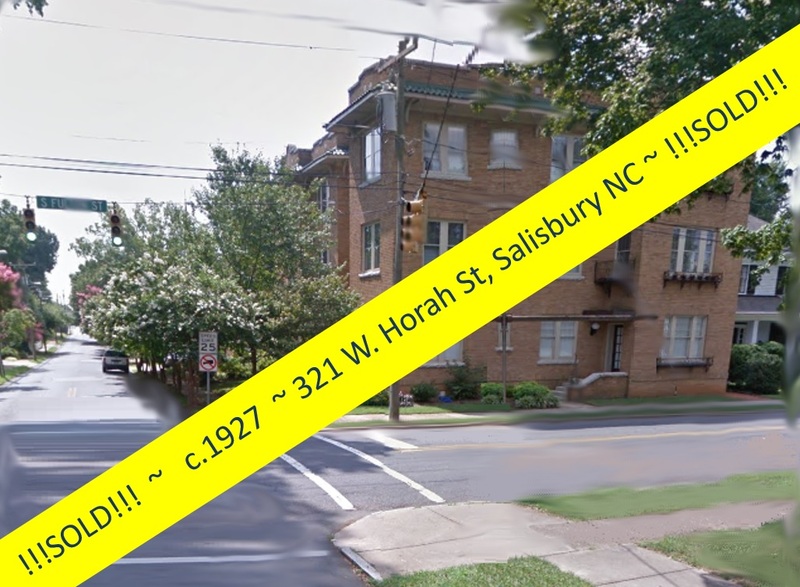 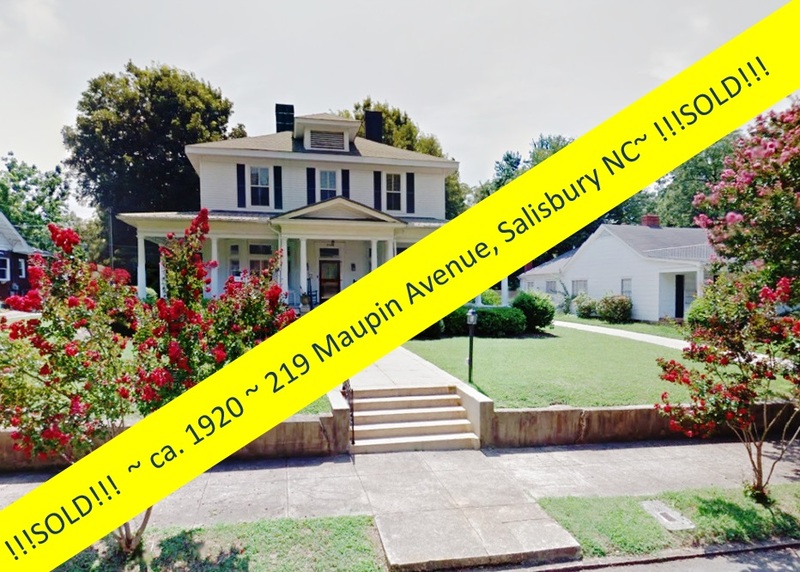 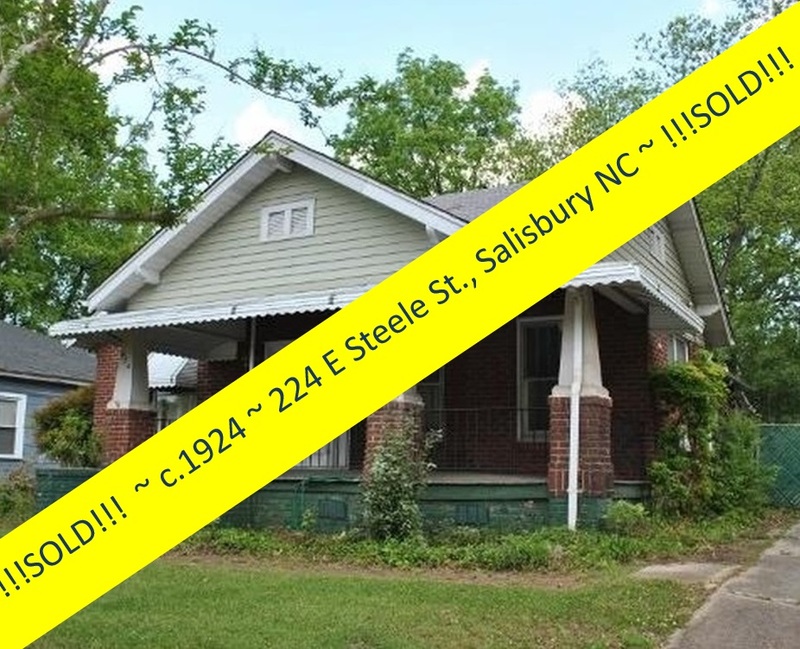 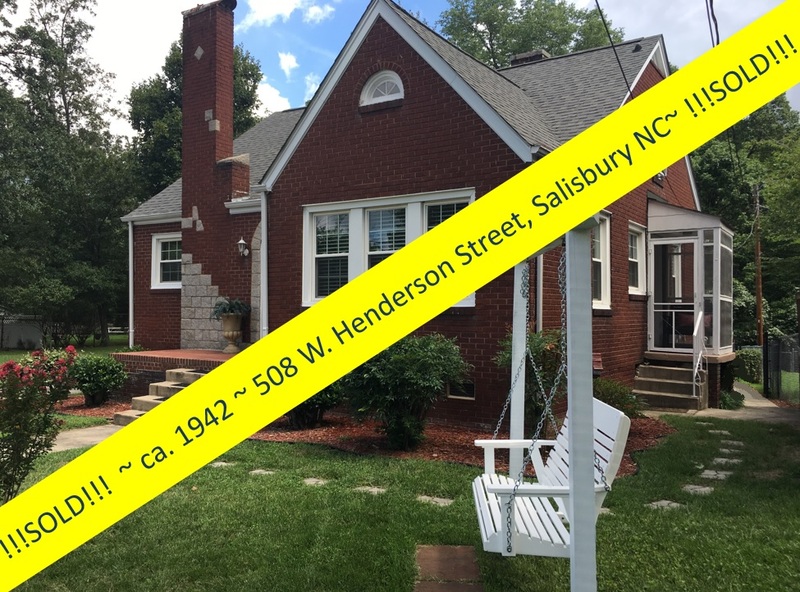 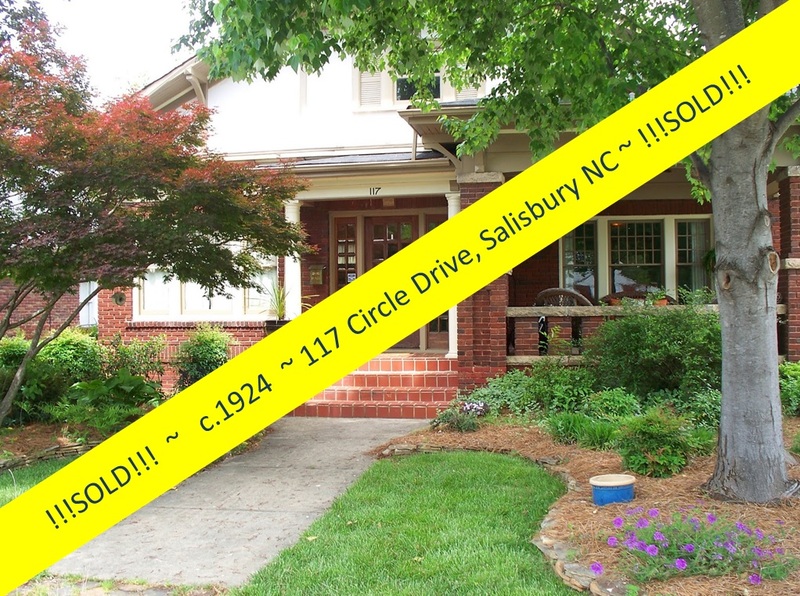 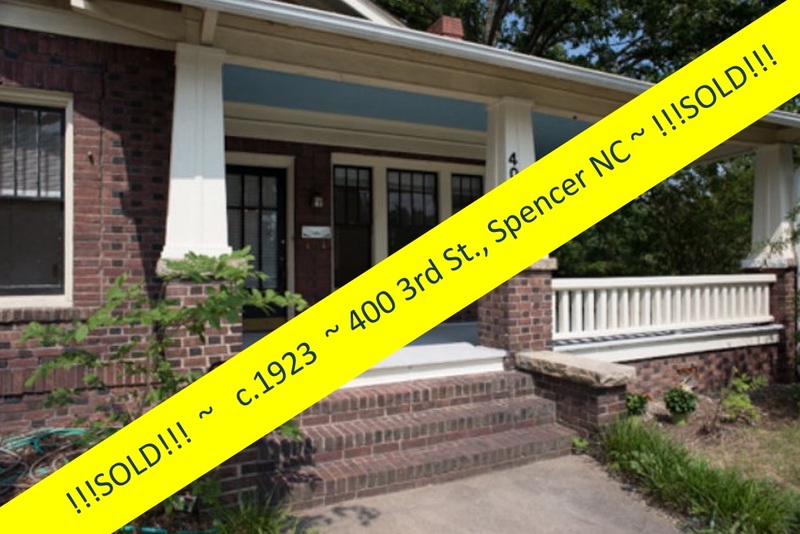 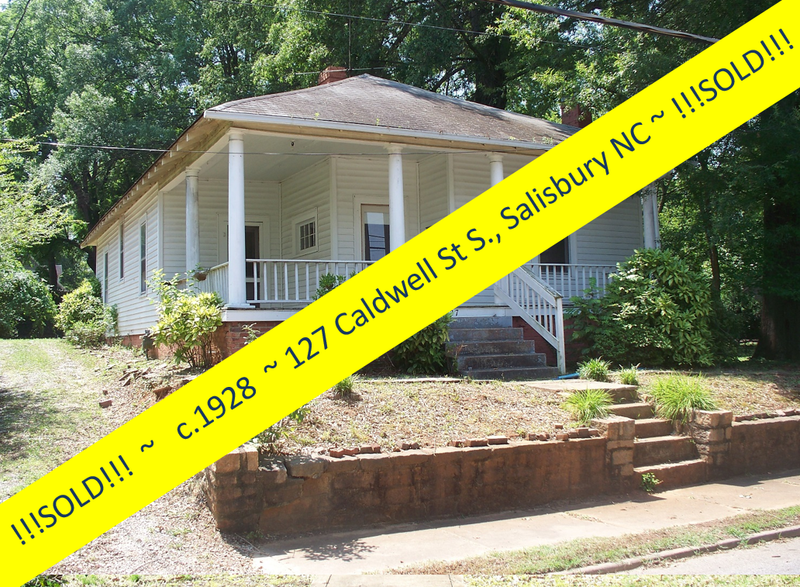 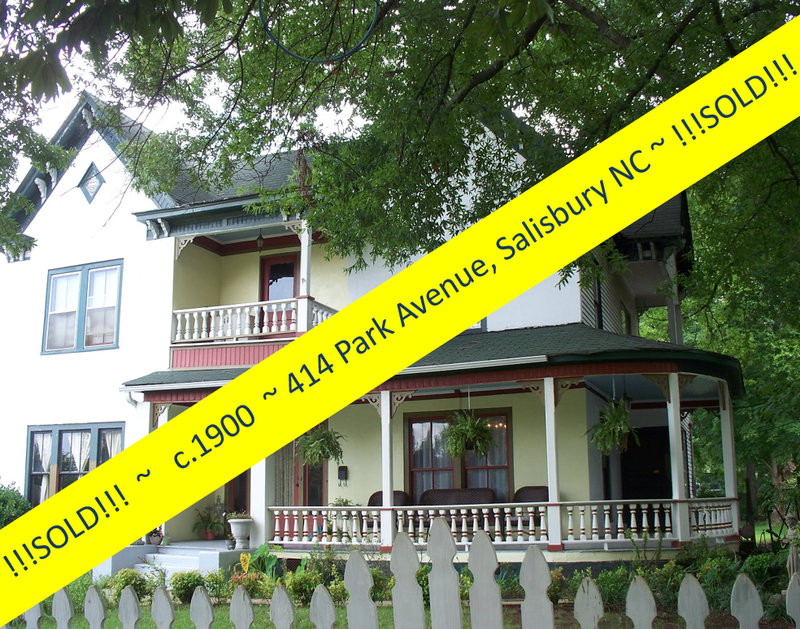 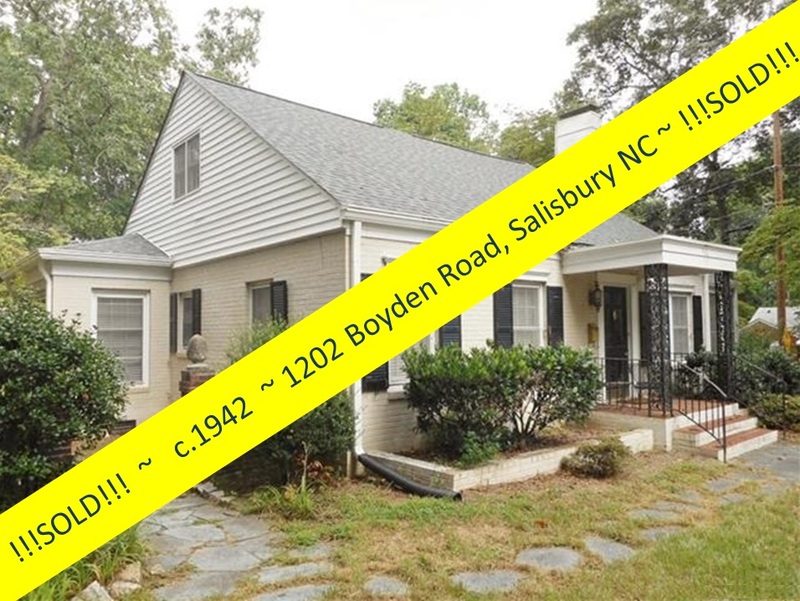 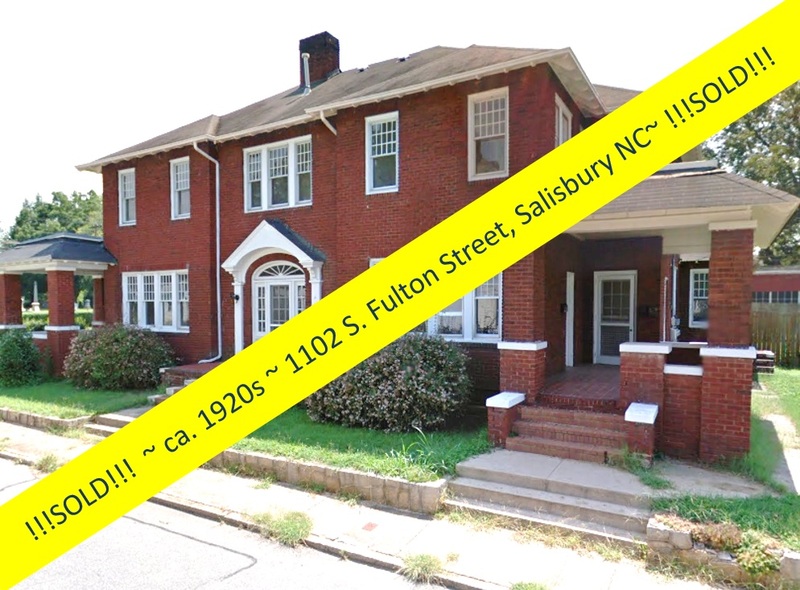 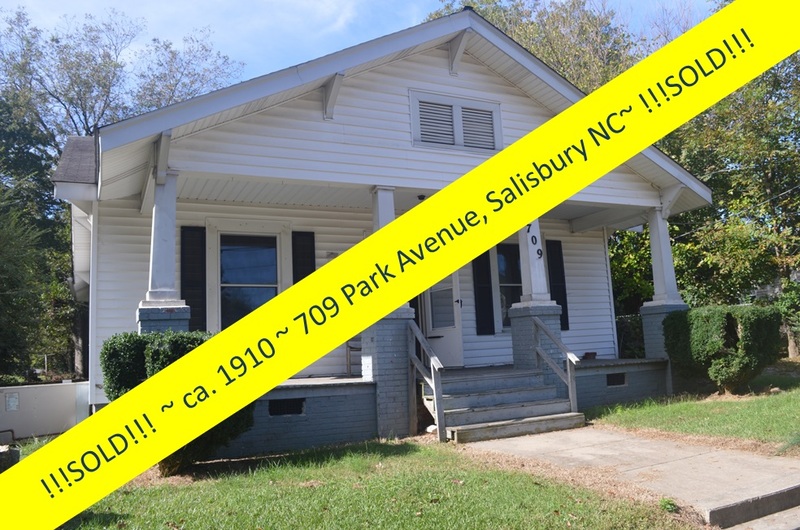 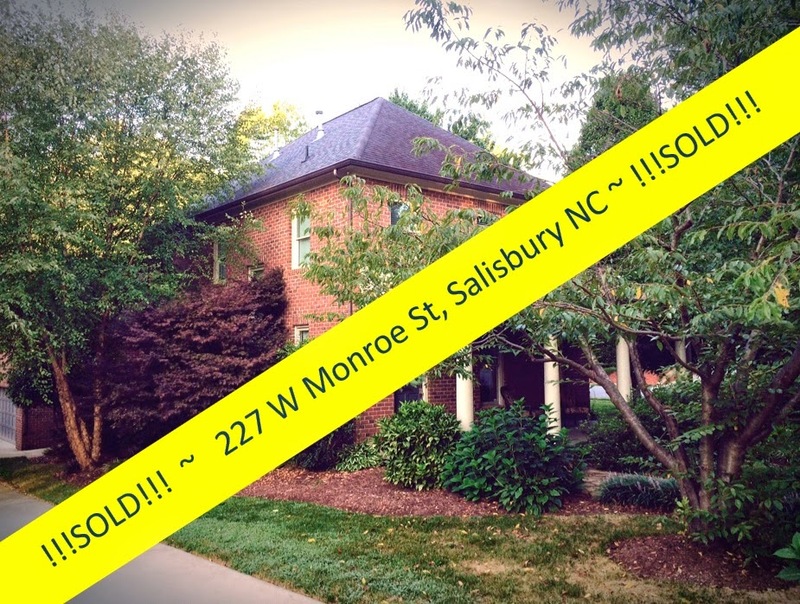 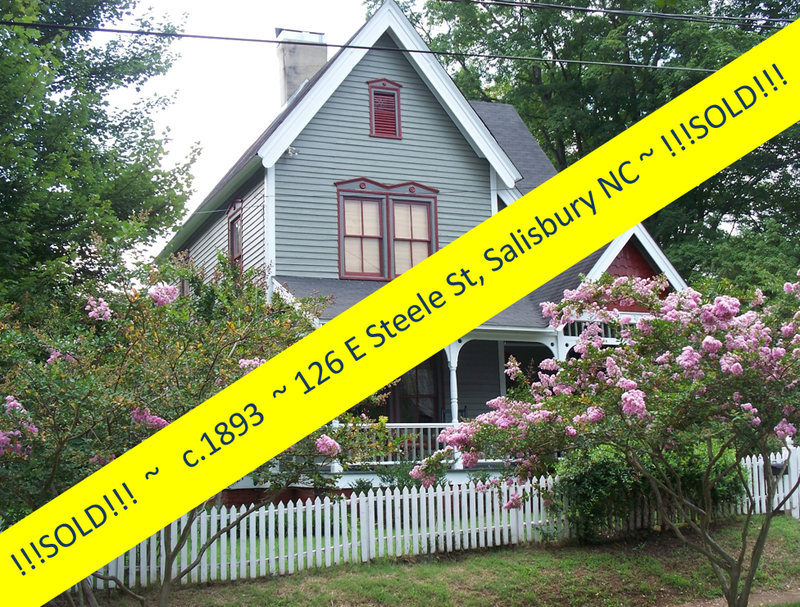 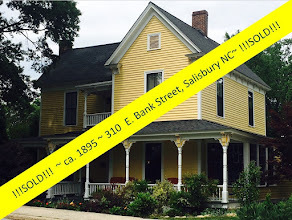 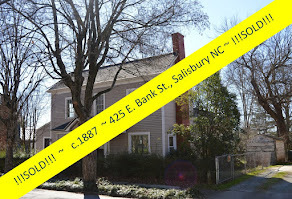 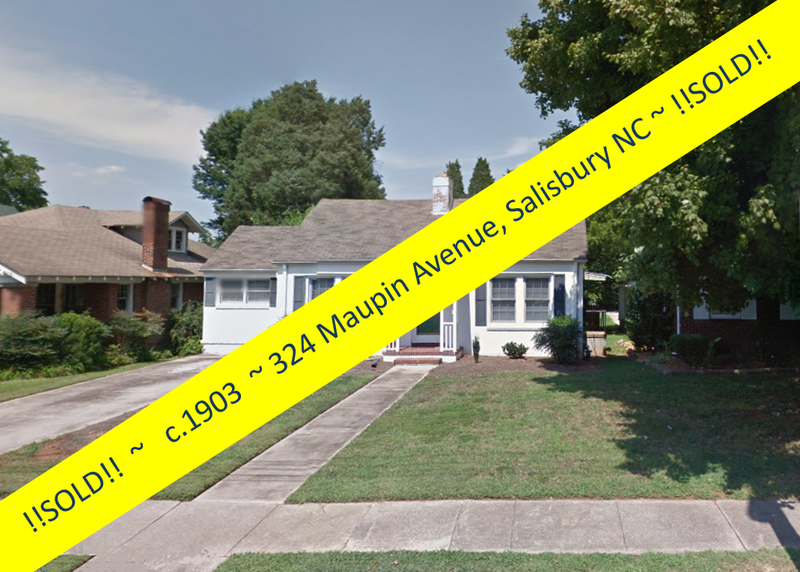 Salisbury, North Carolina Real Estate: Elegant c. 1927 Prairie-School Four-Square in Fulton Heights! 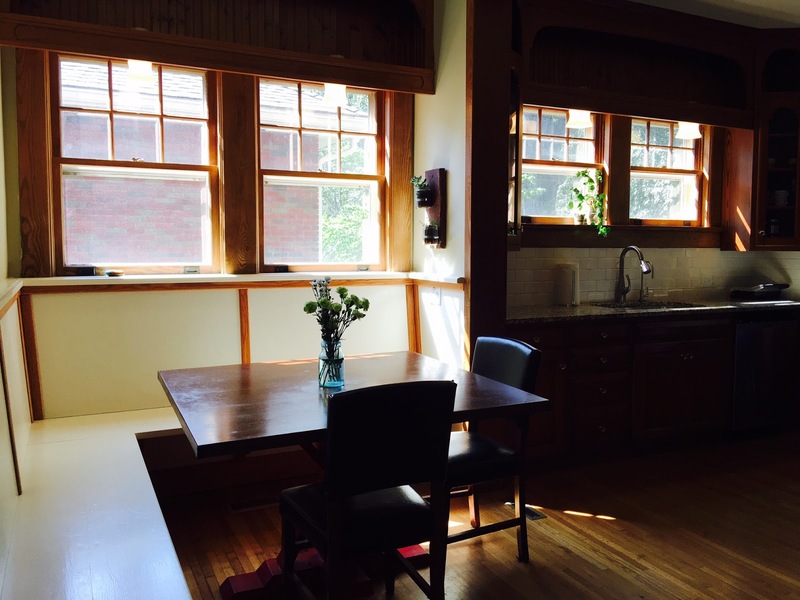 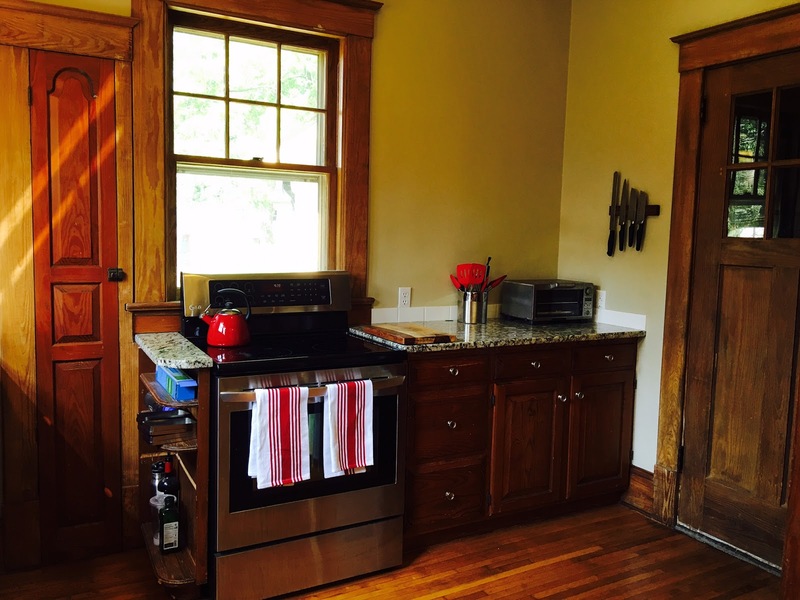 Elegant c. 1927 Prairie-School Four-Square in Fulton Heights! Realtor® Greg Rapp with Wallace Realty has just listed this elegant c. 1927 Prairie-School style Four-Square in Fulton Heights! 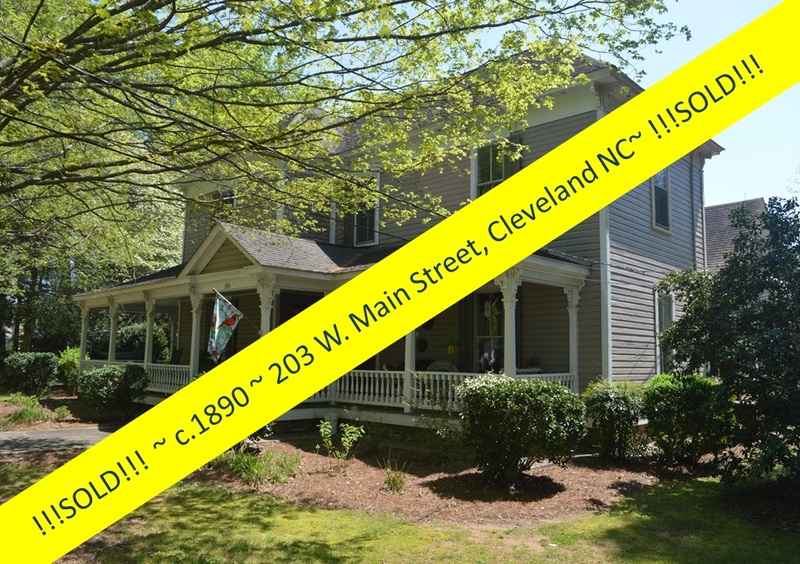 Welcome to the C.L. 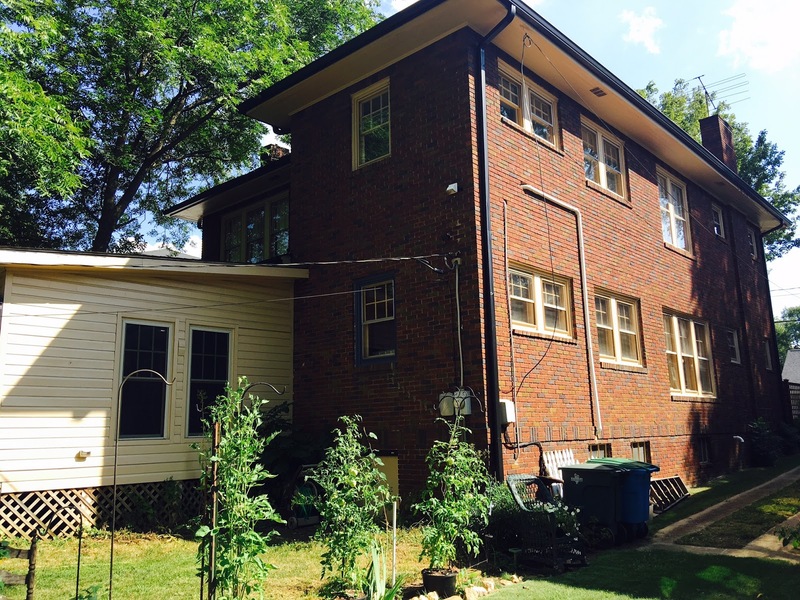 Stoner House at 410 Mitchell Avenue! 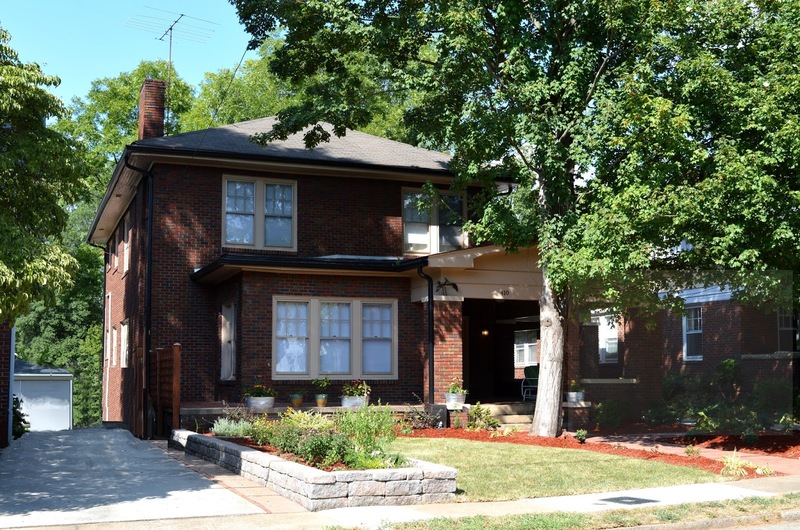 Fulton Heights Historic District, roughly bounded by Fulton Street, Heilig Avenue, Ridge Avenue, and Boyden Street, with Mitchell Avenue as the main spine. 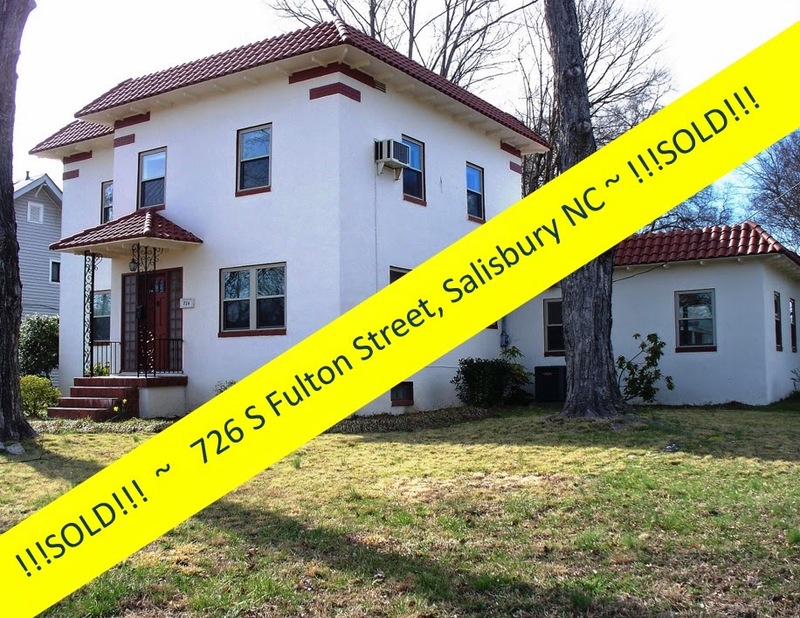 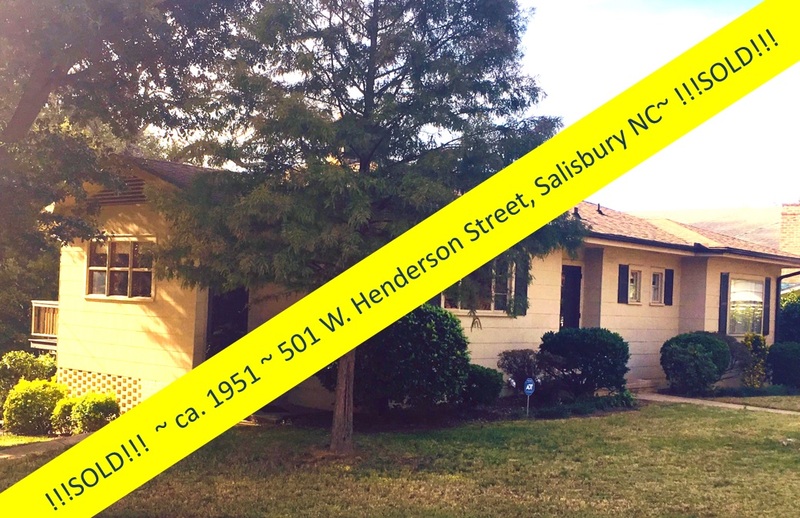 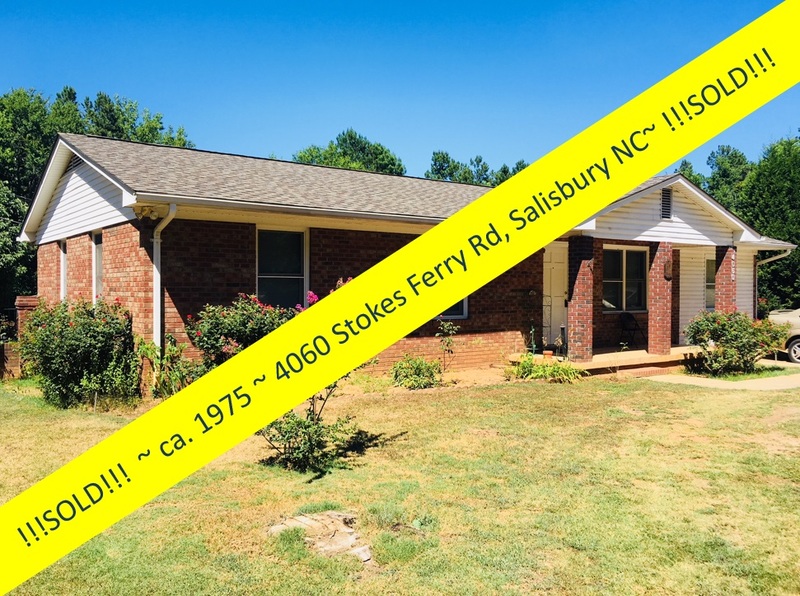 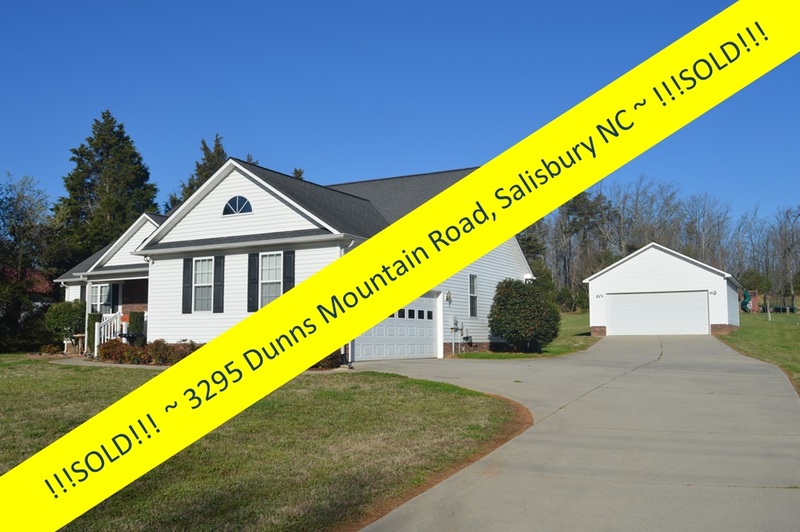 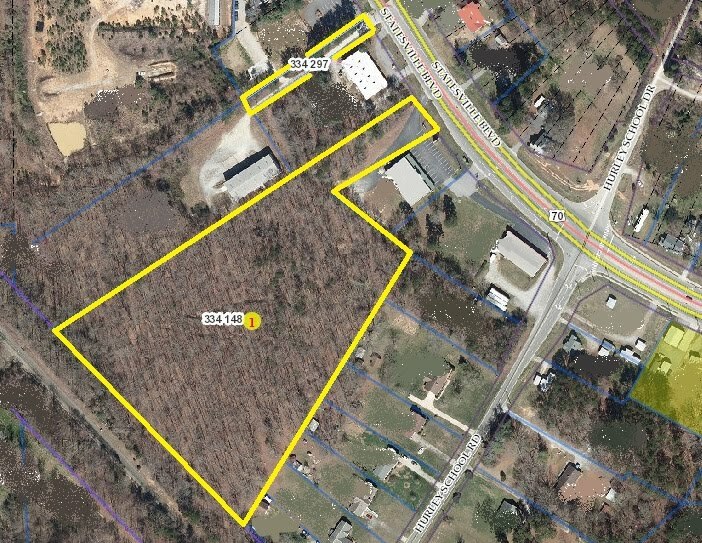 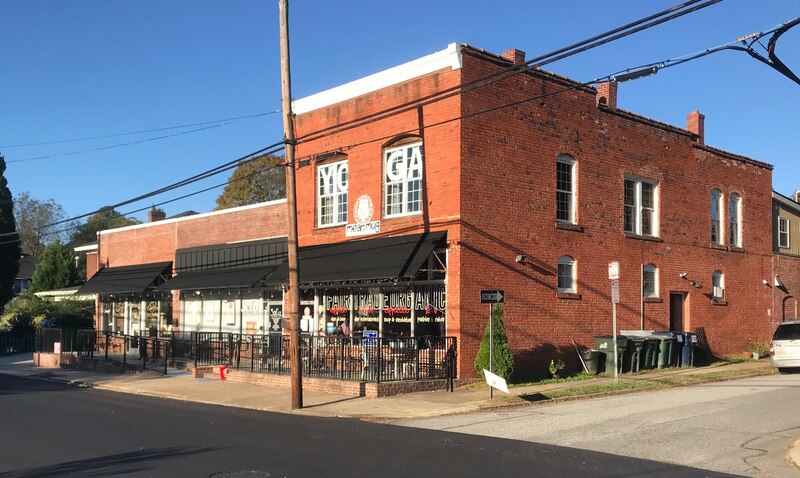 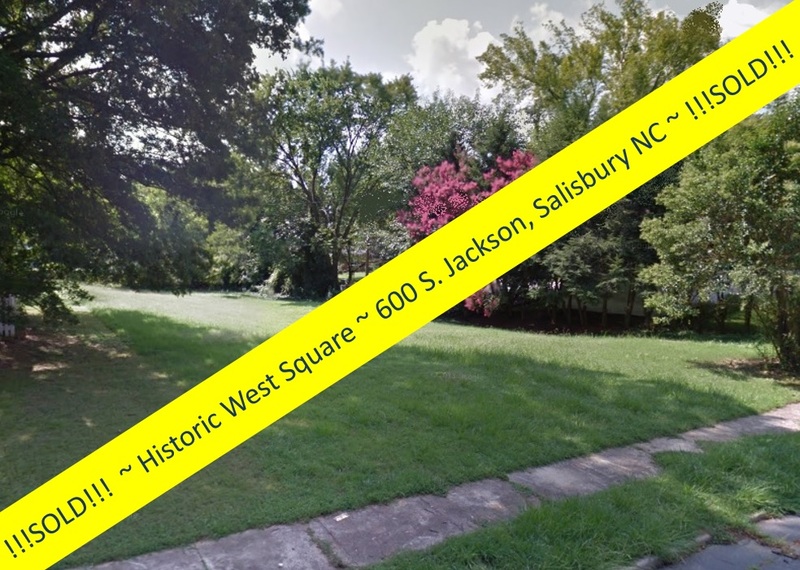 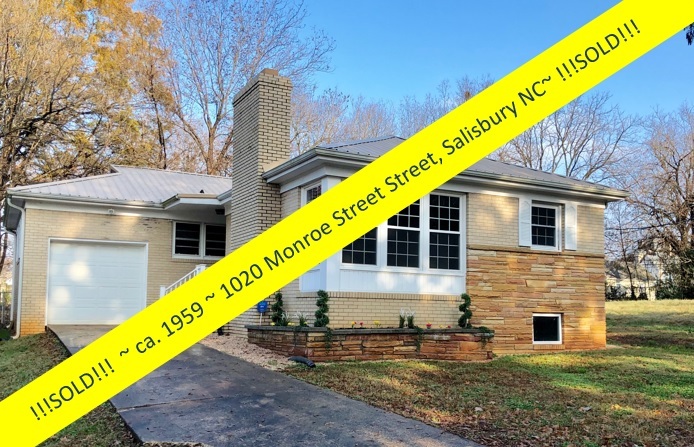 The Fulton Heights neighborhood is a highly desirable area in Salisbury, North Carolina, close to schools, shops, restaurants, and the arts, with a vibrant neighborhood association that plans events and keeps a sharp out for safety and livability in the neighborhood. 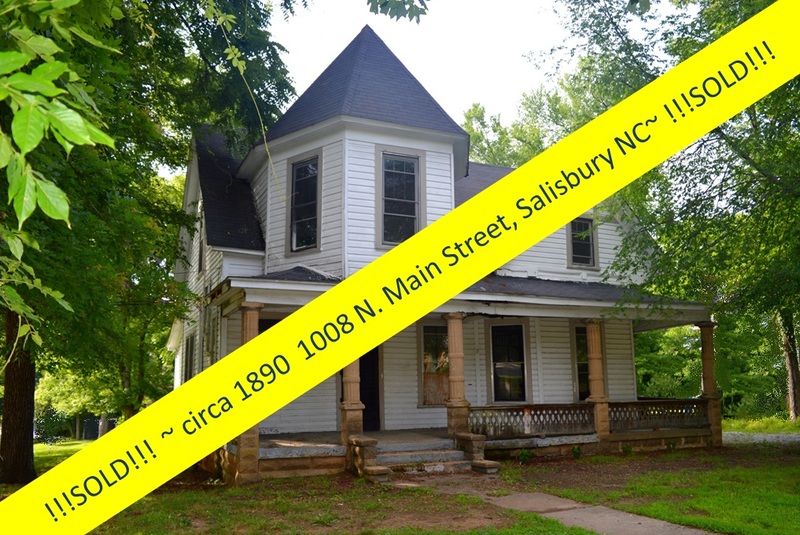 The Salisbury streetcar line, installed in 1901, provided transportation beyond the town's limits and to-and-from the Spencer Shops, a famous railroad repair facility that provided employment for many area workers. 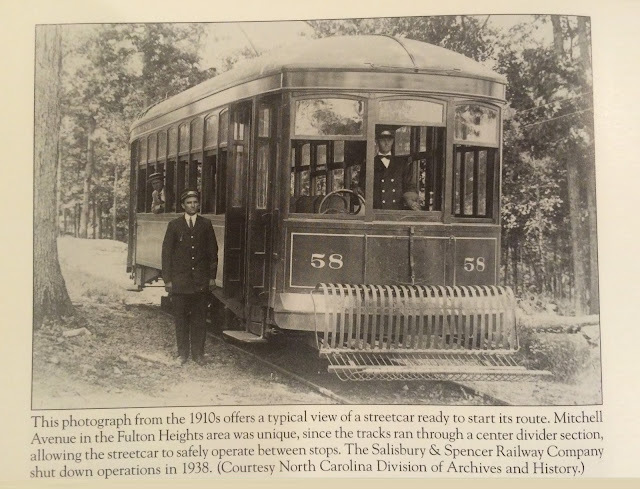 Other North Carolina extra-urban streetcar services were in the city of Wilmington where the streetcar serviced the neighborhoods of Carolina Heights (begun in 1908) and Carolina Place (begun in 1909) and continued to nearby Wrightsville Beach. 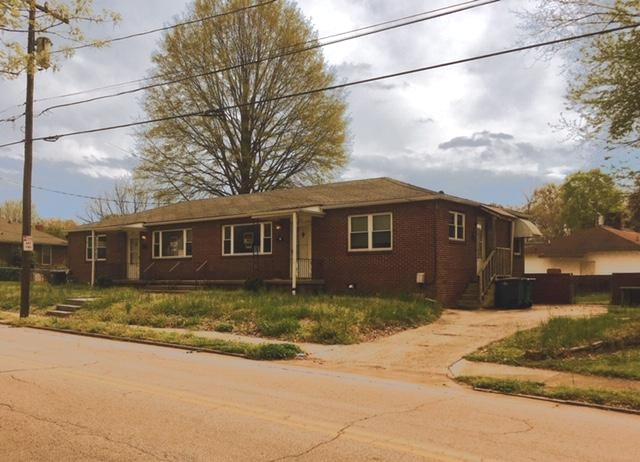 With extra-urban transportation such as this, the construction of larger homes was encouraged in suburban areas, breaking the traditional pattern of development in which the more impressive dwelling places were located only in the downtown areas. 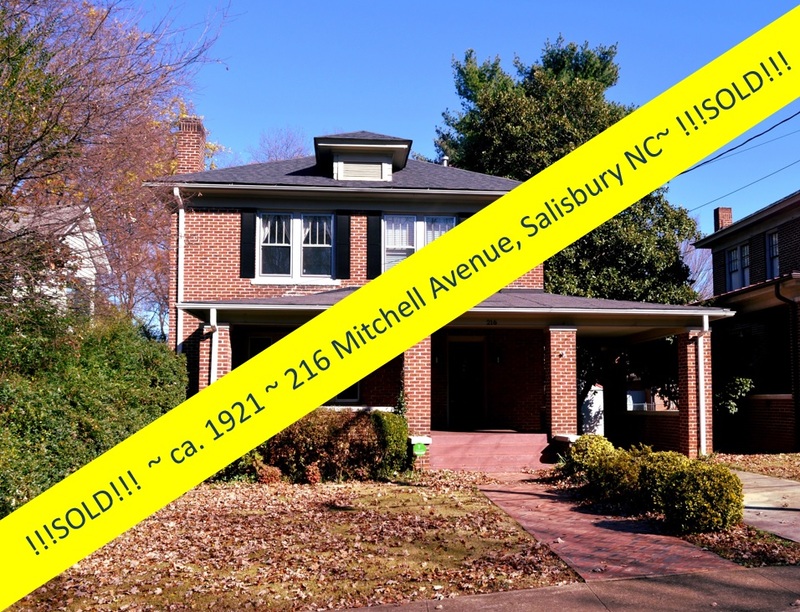 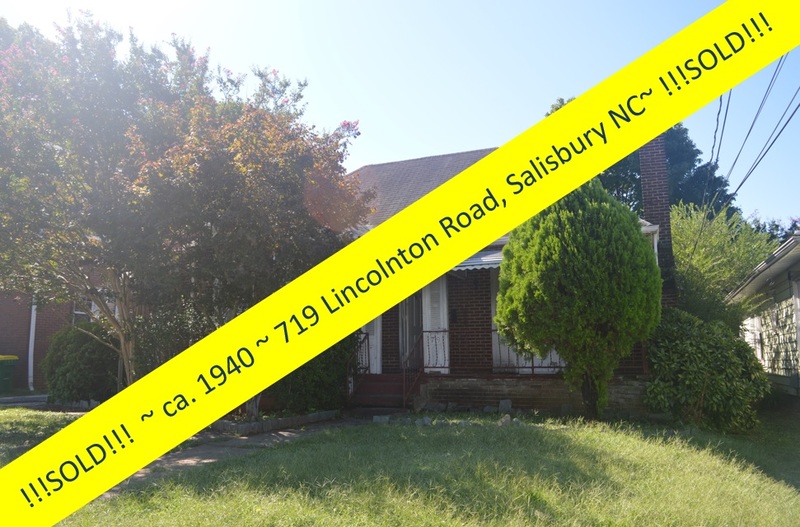 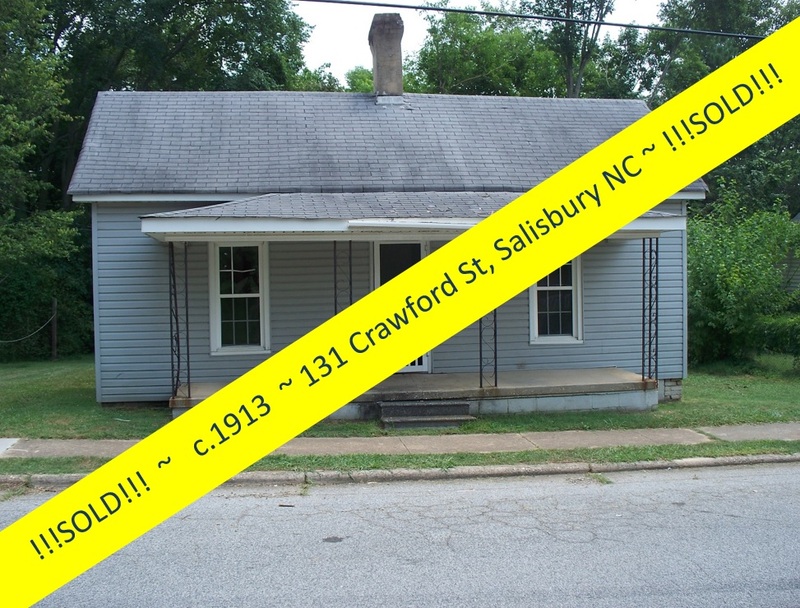 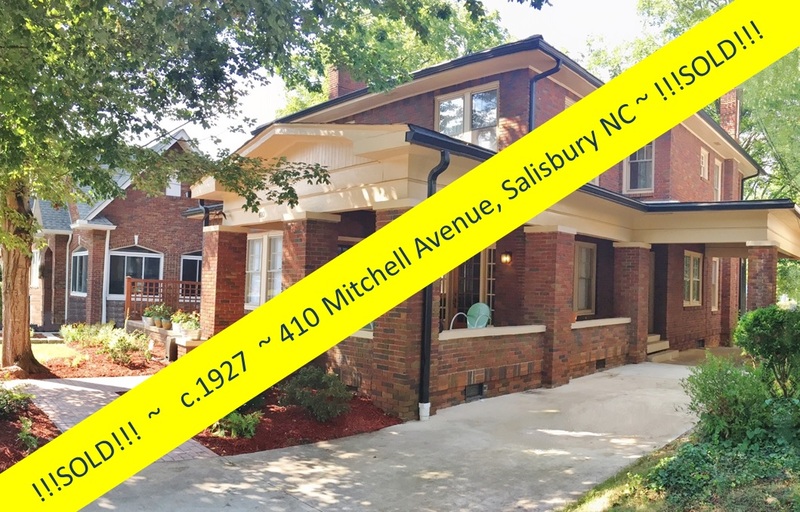 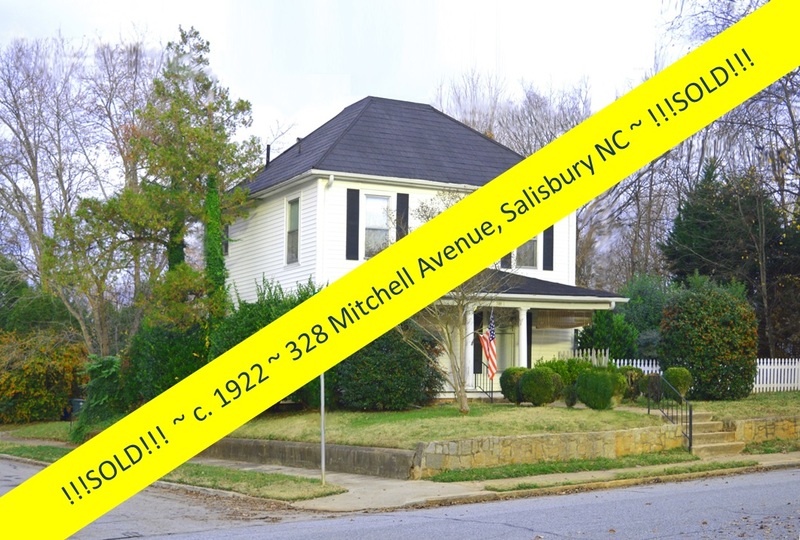 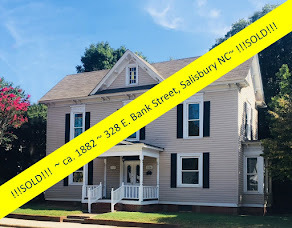 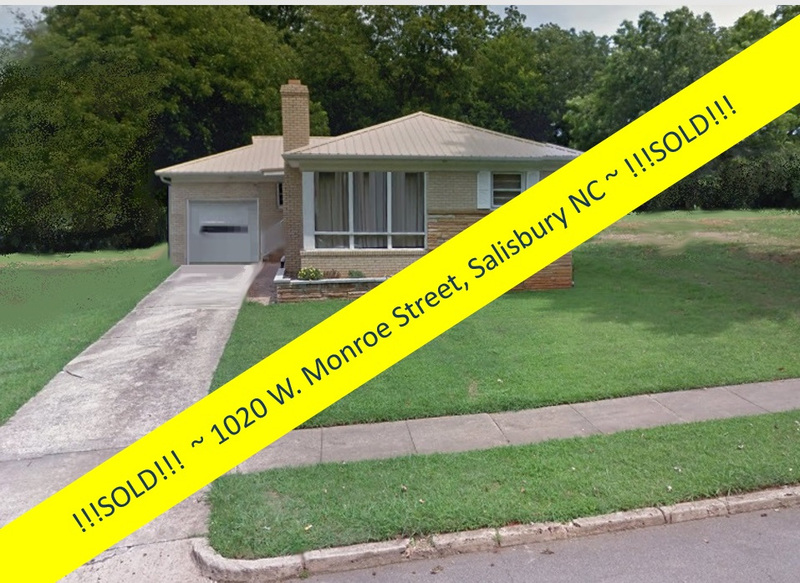 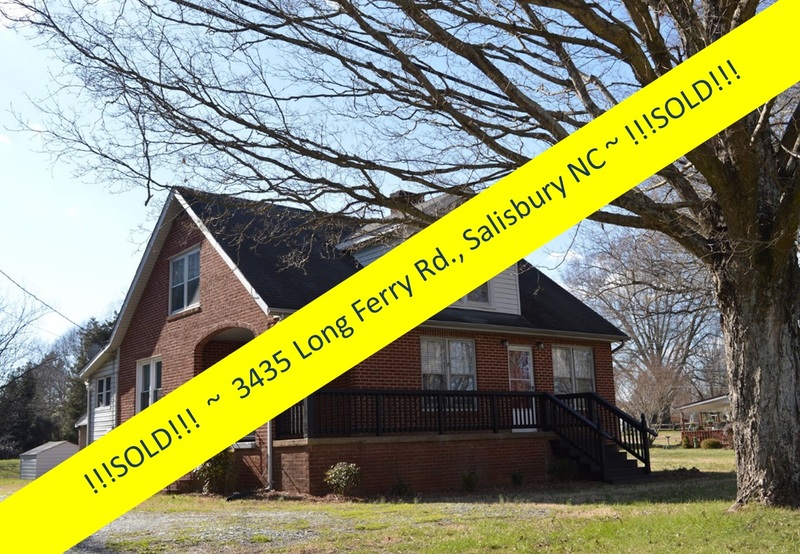 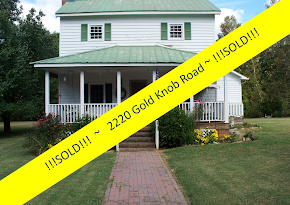 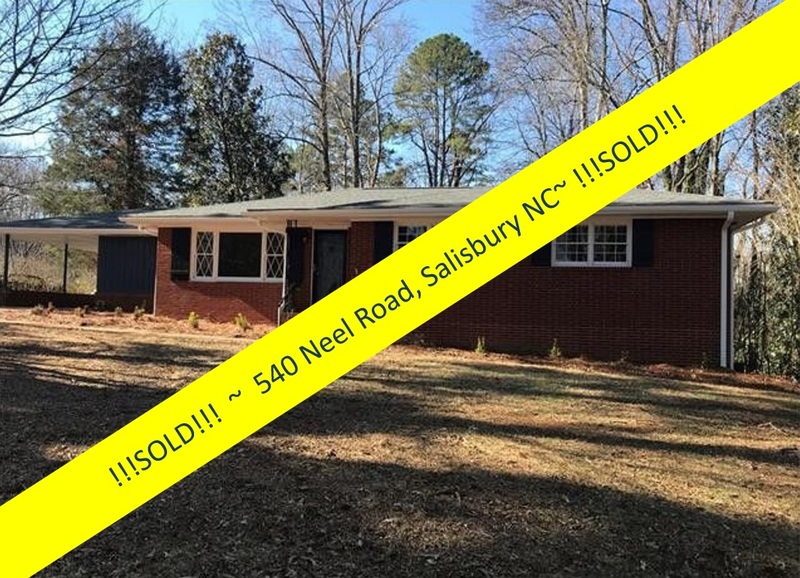 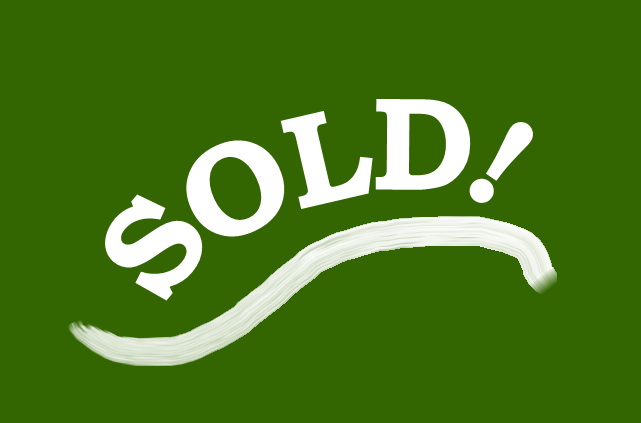 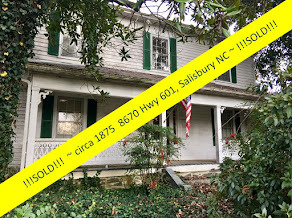 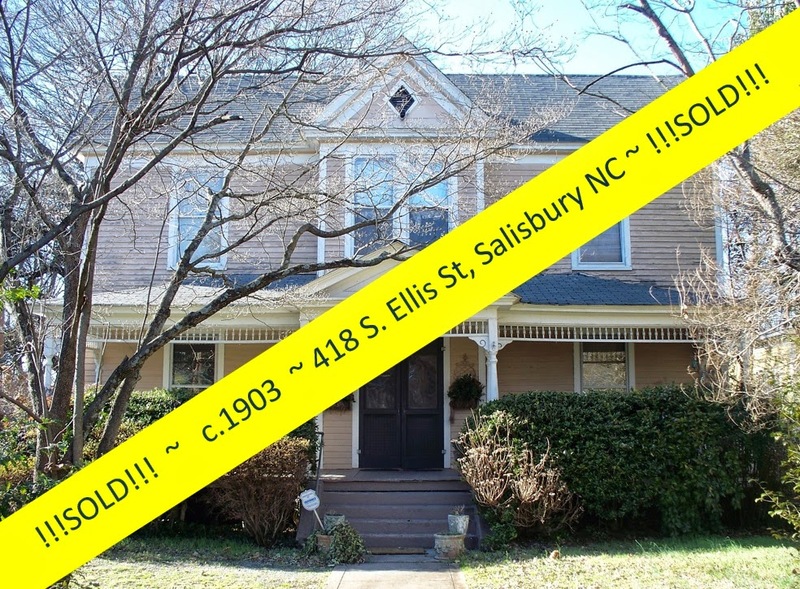 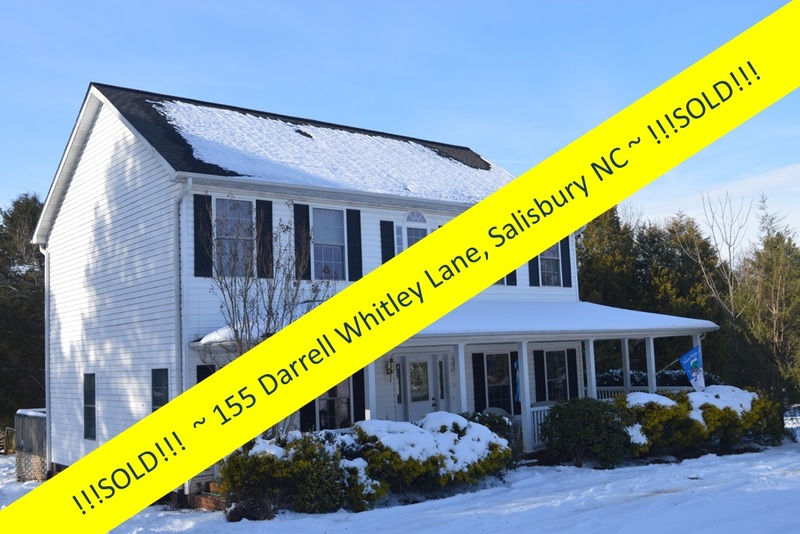 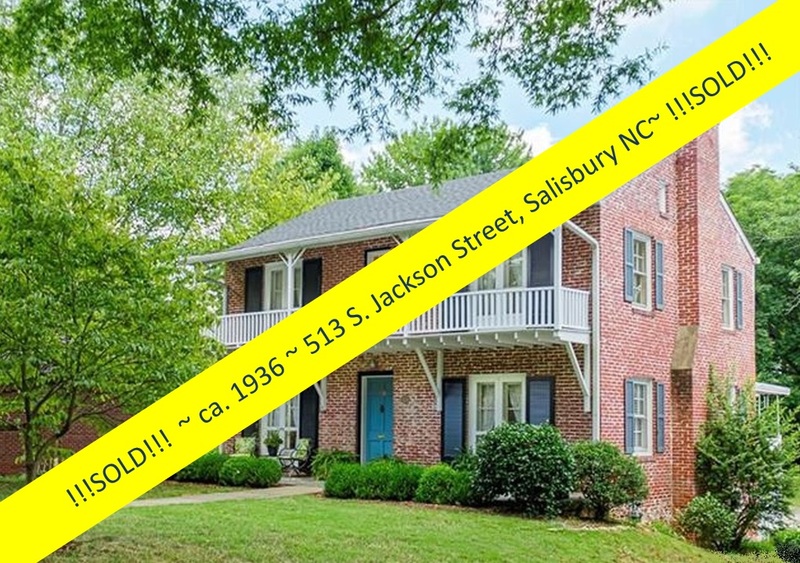 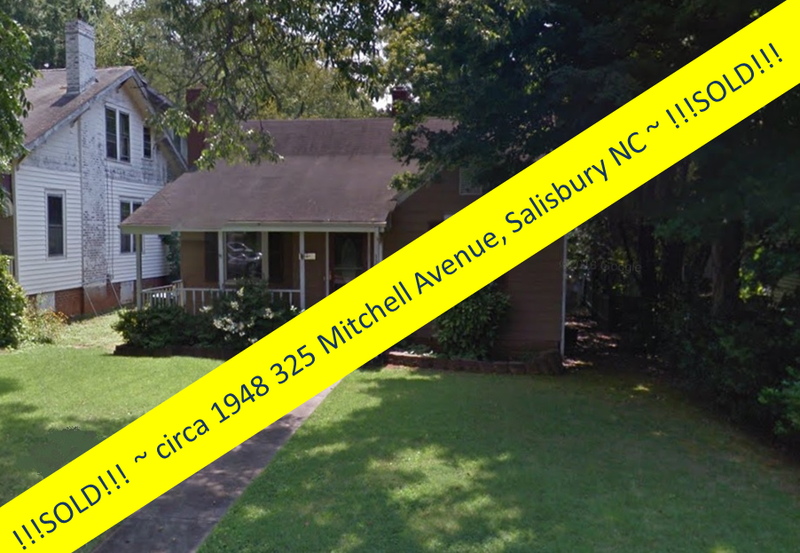 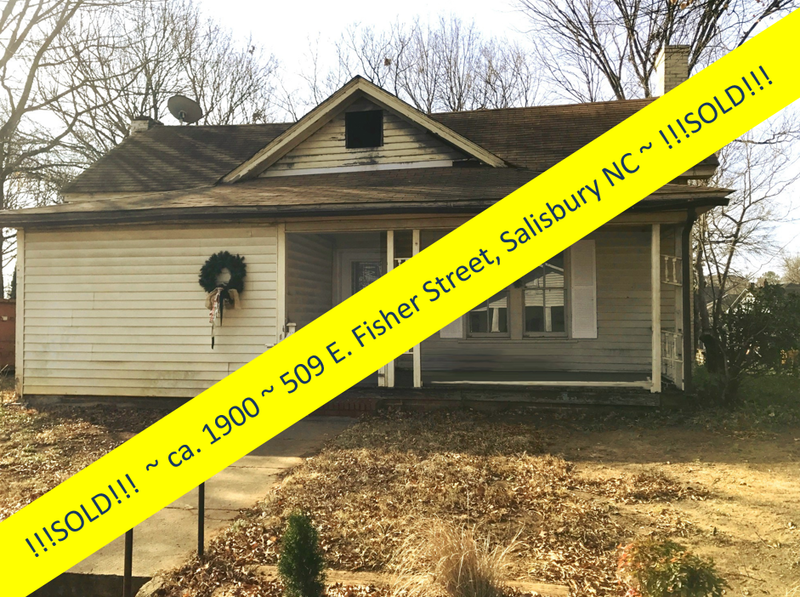 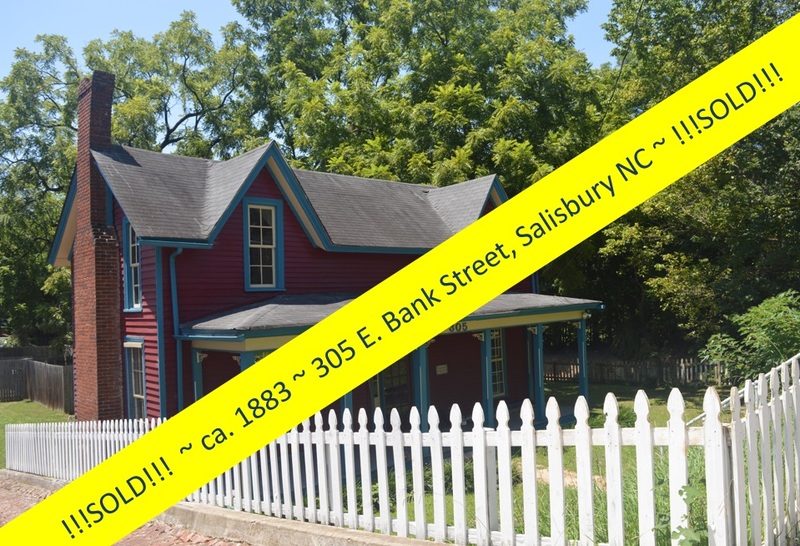 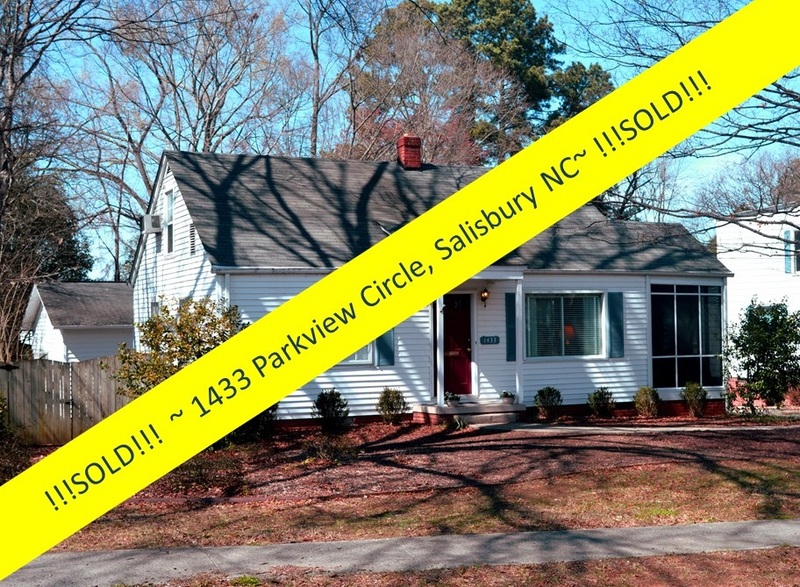 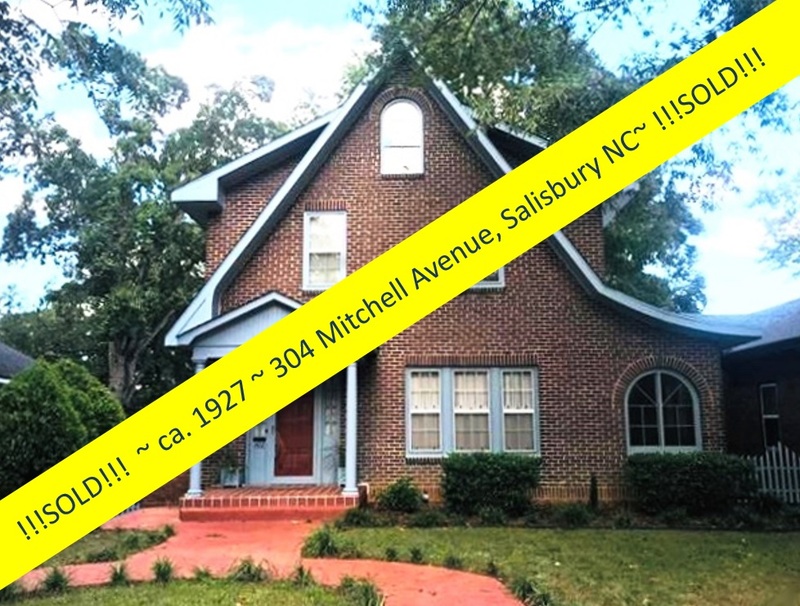 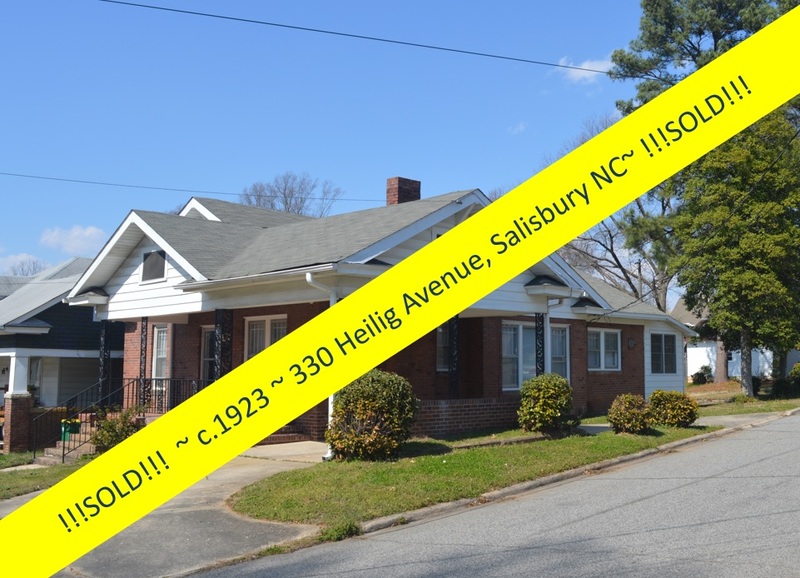 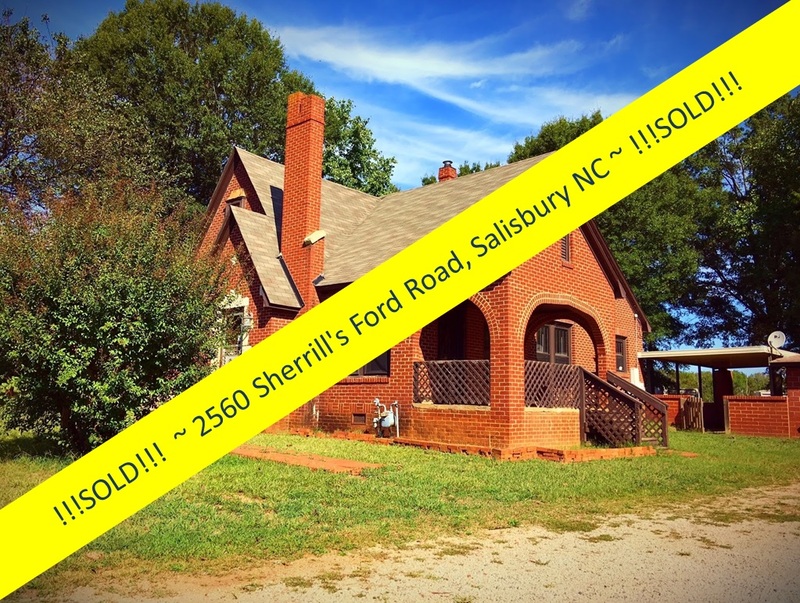 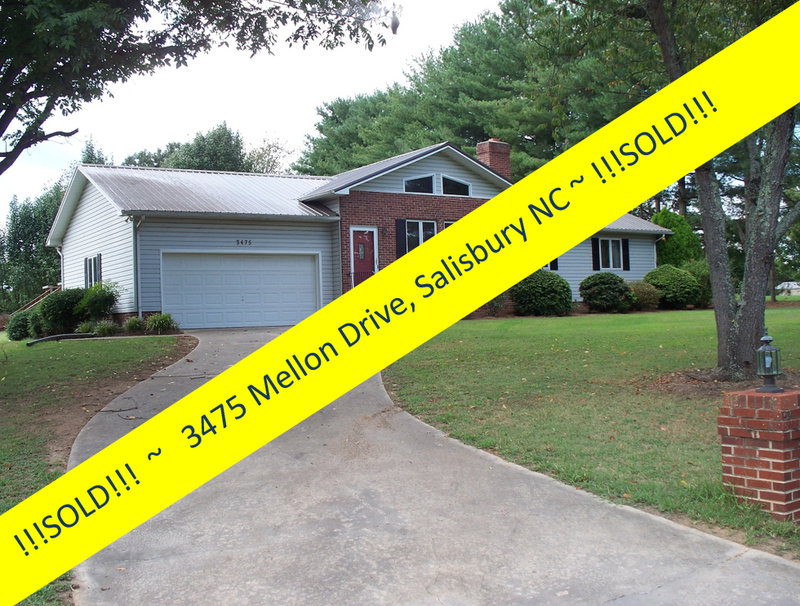 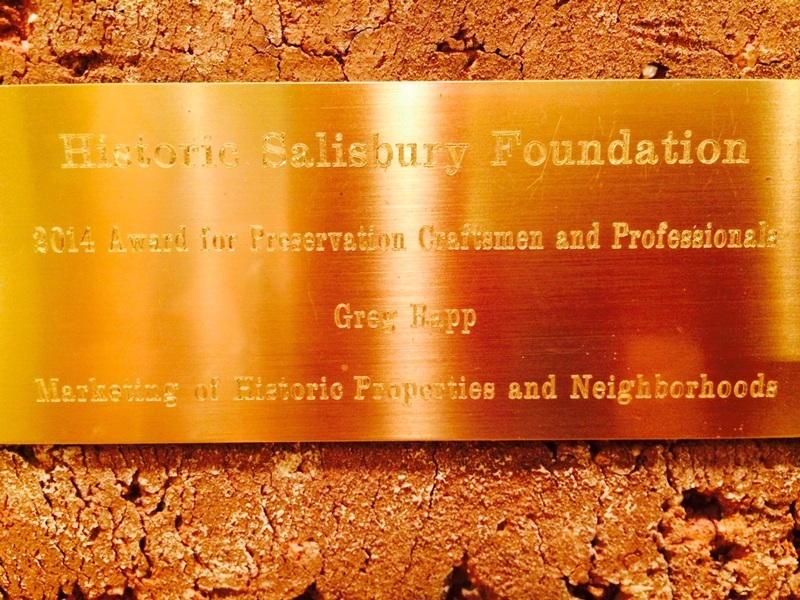 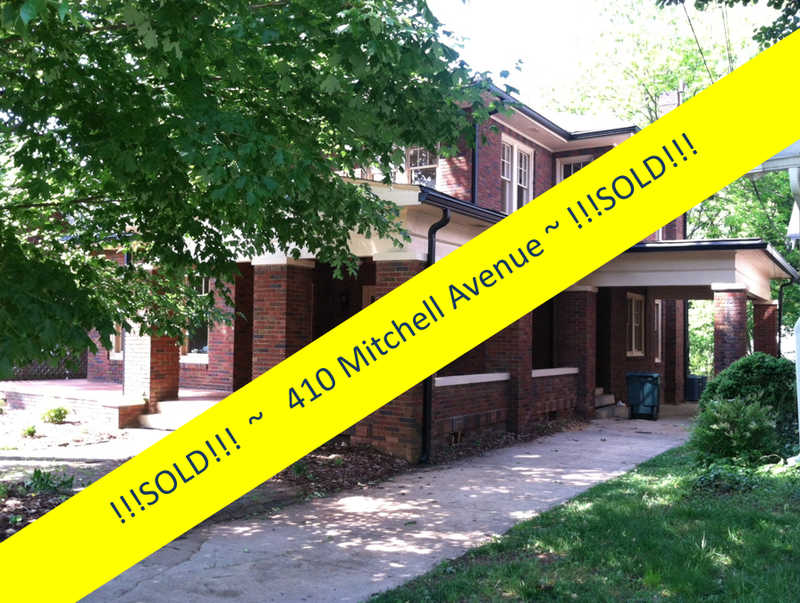 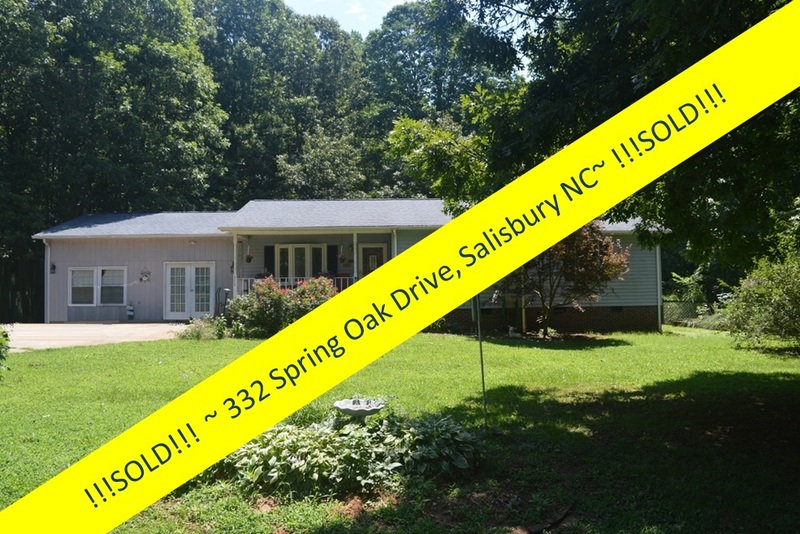 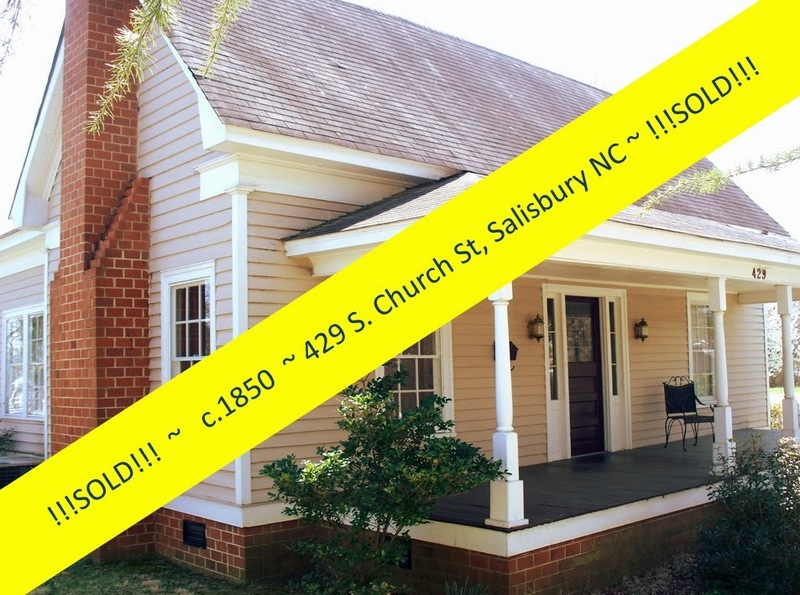 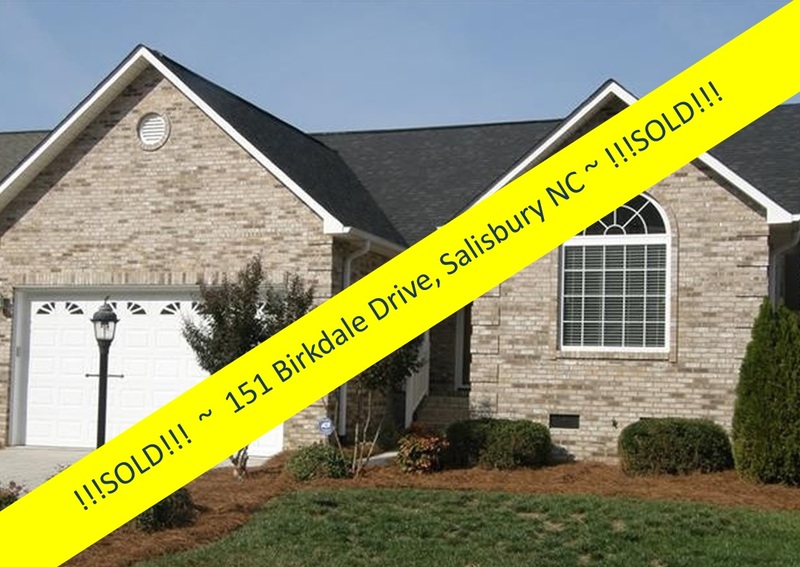 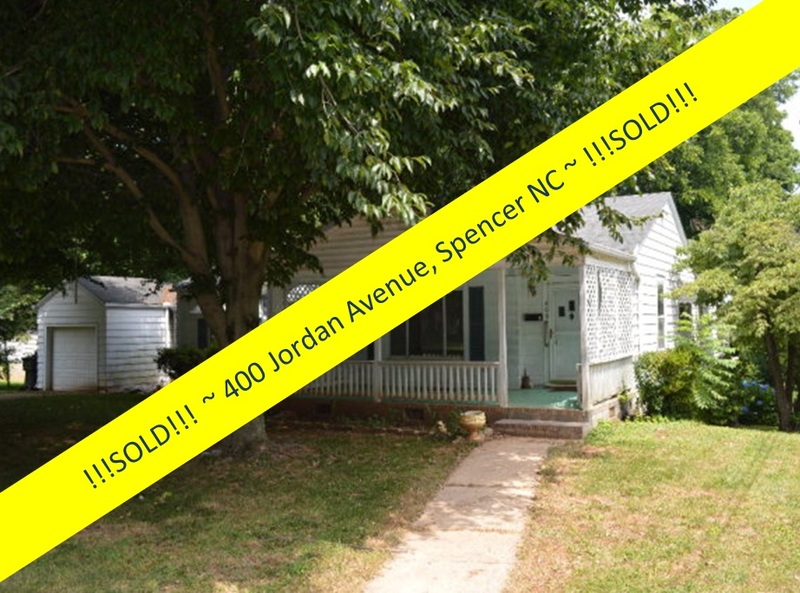 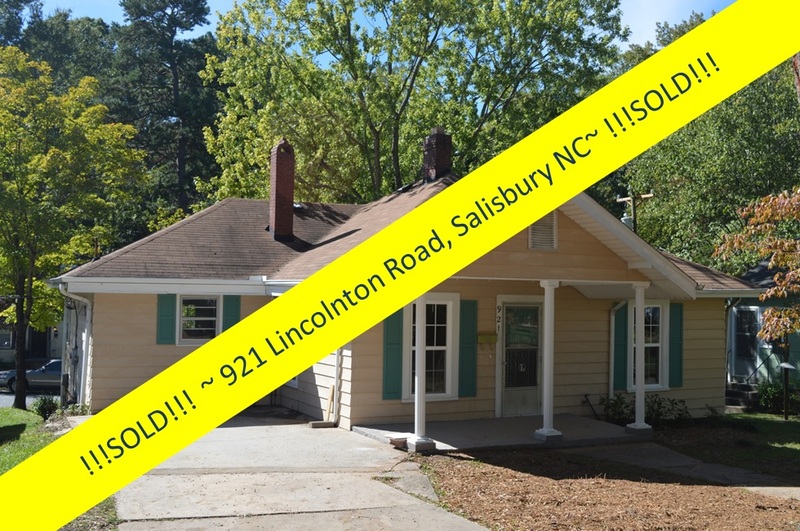 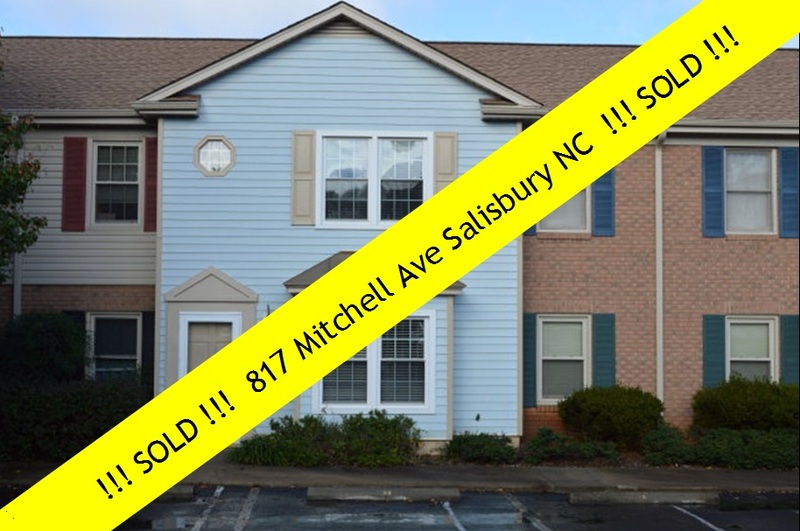 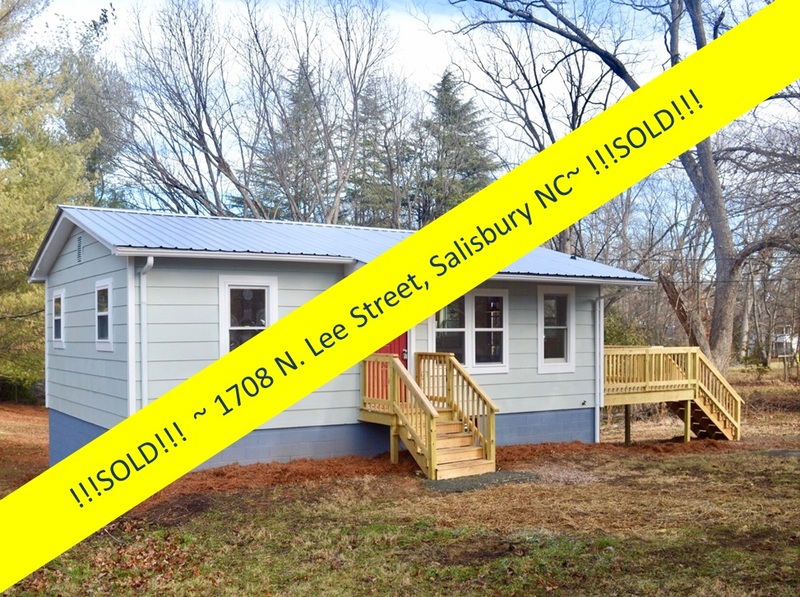 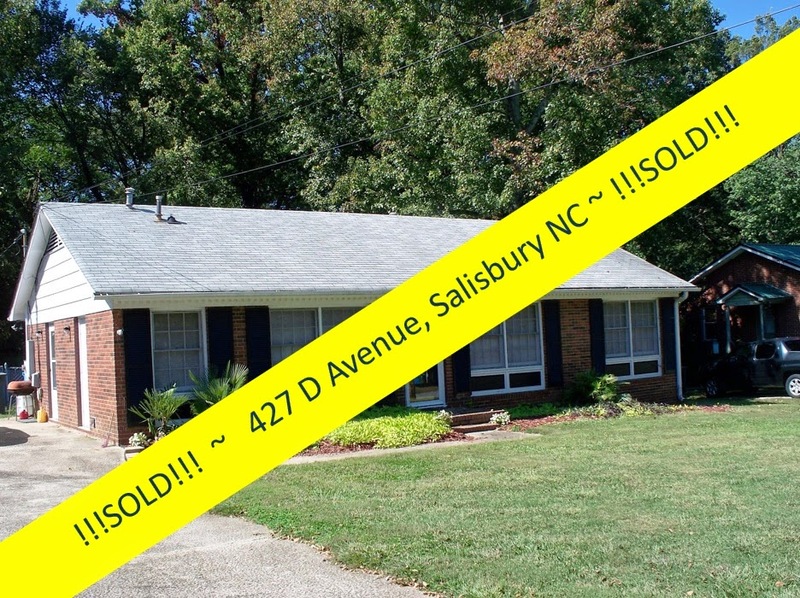 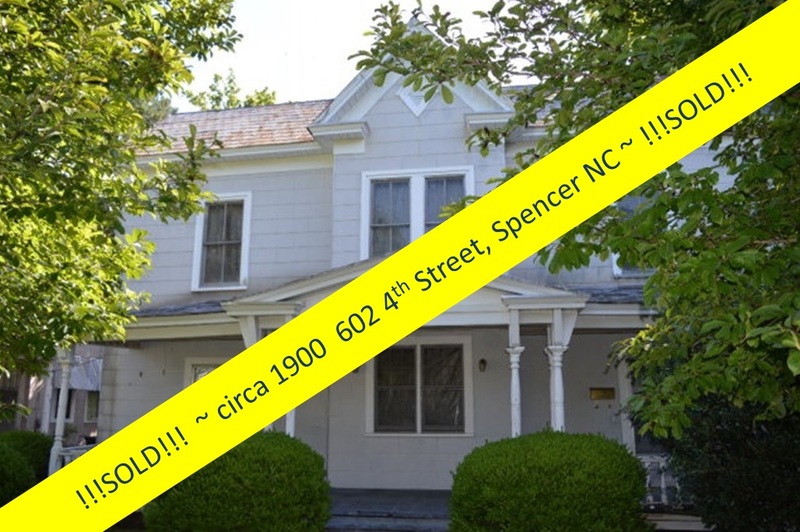 This is true for the Fulton Heights neighborhood, the city of Salisbury's first suburb, that was connected to downtown Salisbury and the Spencer Shops via the Salisbury streetcar line ~ and the large brick home at 410 Mitchell Avenue is a prime example of such! 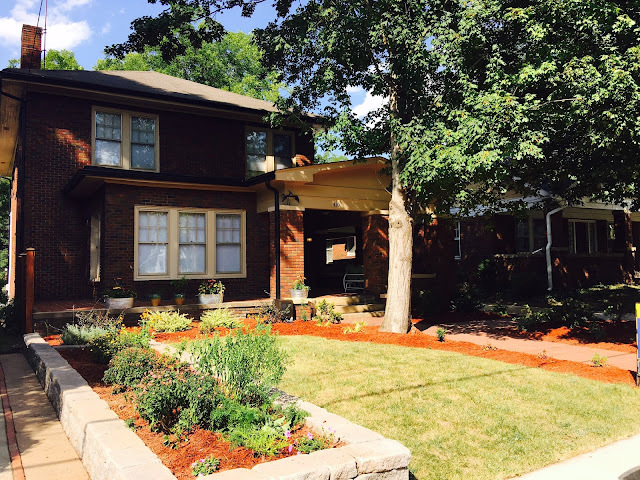 The historic neighborhood of Fulton Heights, whose period of architectural significance is from 1903-1948, is arranged in a grid pattern of about 400 homes and includes an inviting neighborhood park that residents funded and had built. 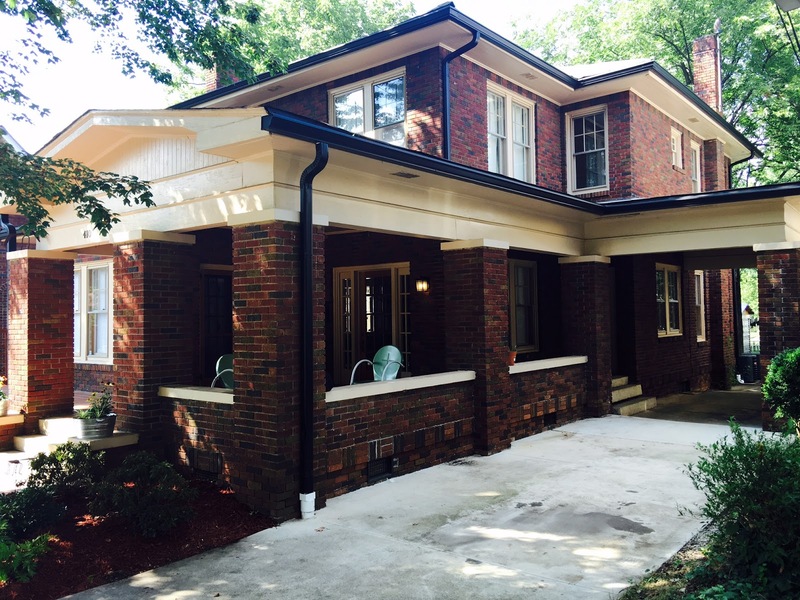 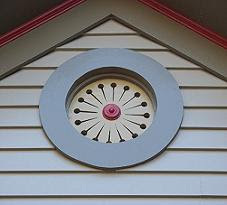 Contributing architectural styles are predominantly Colonial Revival, the Bungalow / Craftsman, and Tudor Revival. The C. L. Stoner House, circa 1927, is built in the Prairie School style as seen in four-square-form brick houses, with wide eave overhangs beneath a hipped main block roof and a porch roof supported by a substantial brick porch. Lots of American Arts & Crafts influences can be found in this wonderfully spacious 3253 sq ft home, including beveled glass at every turn, built-in bookcases flanking masonry fireplaces, gleaming wood floors throughout, and a deep tile front porch. 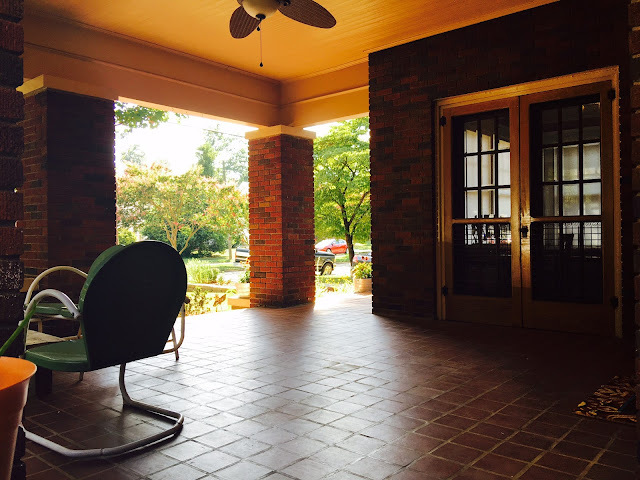 And how about that front porch! 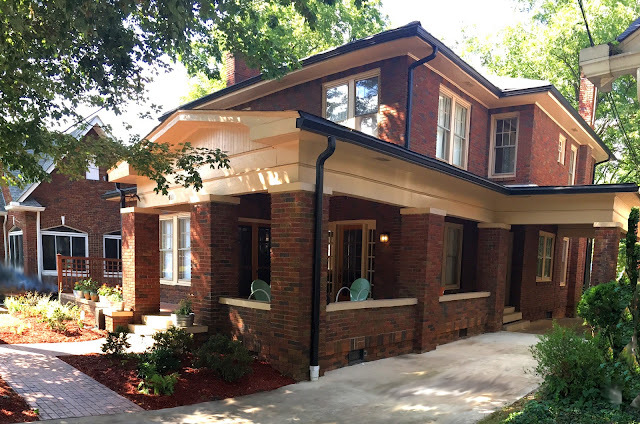 The front-gable wrap-around porch has a deep covered area, almost like an outdoor room, with width and breadth enough for three-season entertaining. The porch then wraps around the front of the home where an uncovered area awaits for the sun lovers, both plants and people! 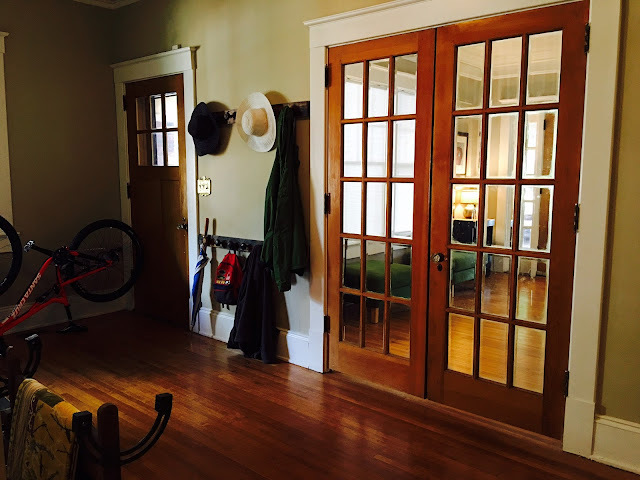 Double French doors frame the huge living room! 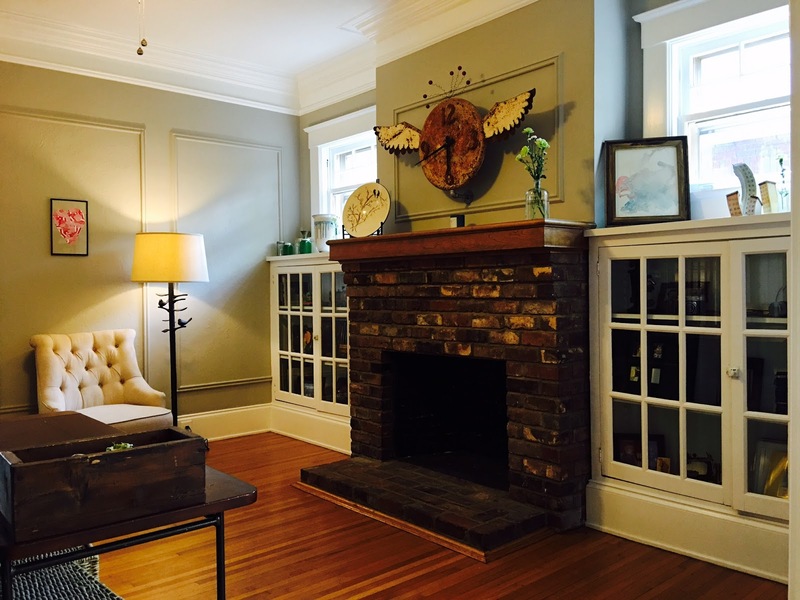 This wonderful front room spans nearly the entire front of the home ~ a versatile expanse of 28'x14' space with built-in bookcases flanking a masonry fireplace. The spacious foyer creates another 'room' with a French door entry to the living room, the handsome staircase to the upper level, and a hall to the kitchen and main floor bath ~ which was recently completely remodeled with subway tile walk-in shower, wainscoting, and other period details. A second set of French doors leads from living room to the gracious dining room streaming with natural light. 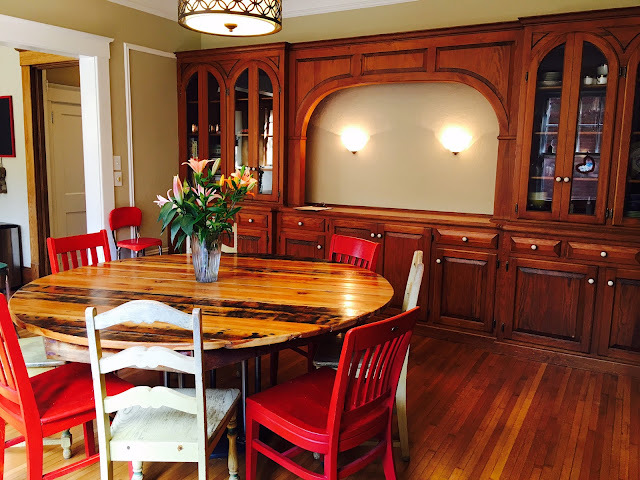 This sunny room provides an entire wall of beautiful built-in china and storage cupboards and sideboard with wall sconces. From the dining room, enter the high-ceiling'ed kitchen that features a breakfast room with built-in banquette, lovely glass-front corner cabinets, and granite counters. 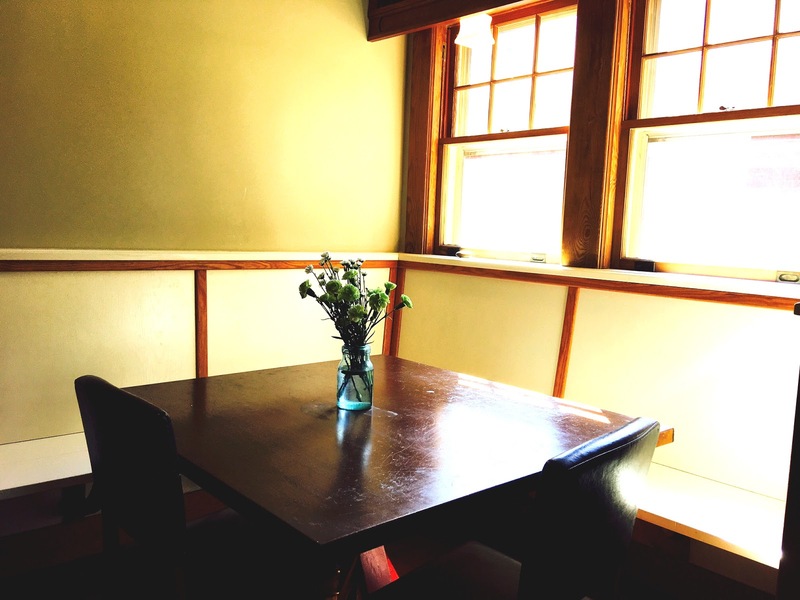 The striking period trim and moldings in this sophisticated space hold a rich stained and are not painted ~ a rare find! 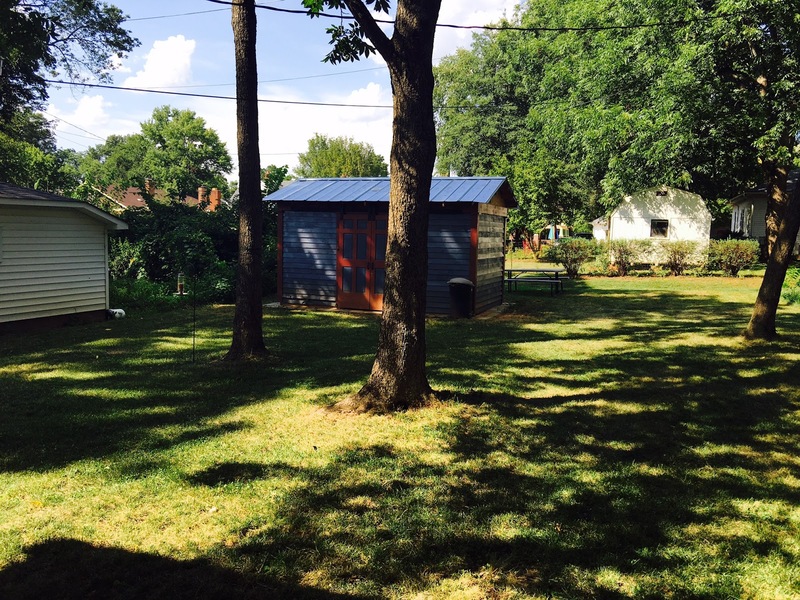 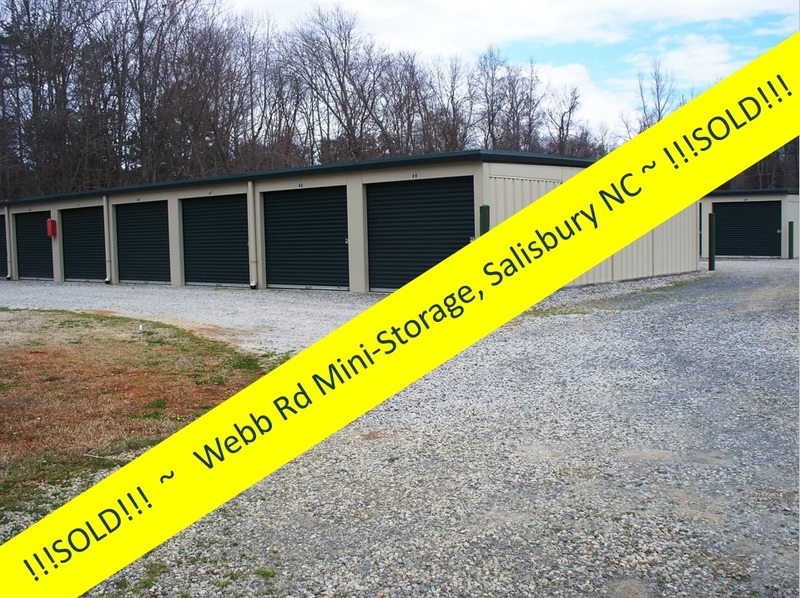 A large pantry holds more dry goods and cookware, and leads to a large unheated back room or enclosed porch ~ a great garden room or hobby/play area ~ which then leads to the deep back yard and storage shed. 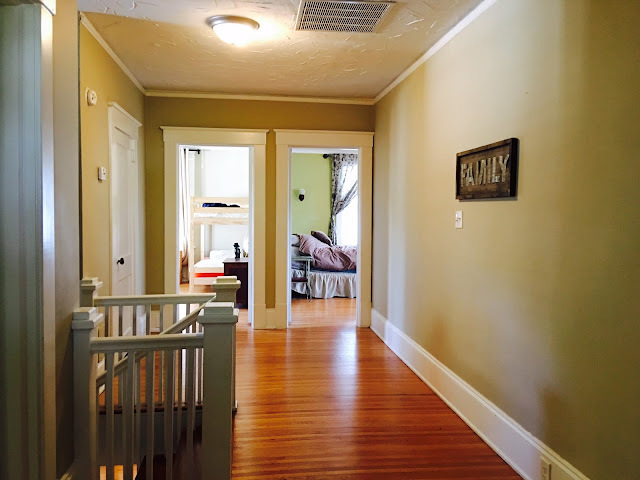 A large guest bedroom is located on the main floor. 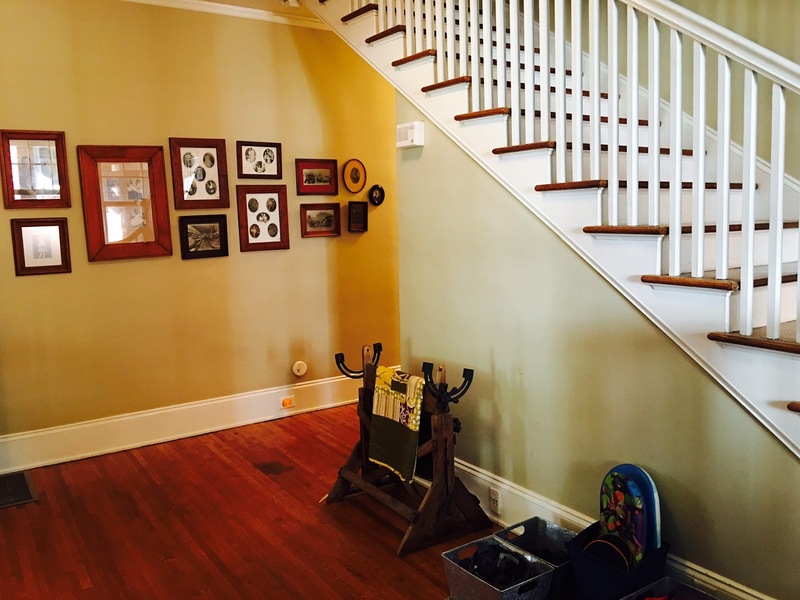 Upstairs a large landing greets you and takes you to the three upstairs bedrooms. 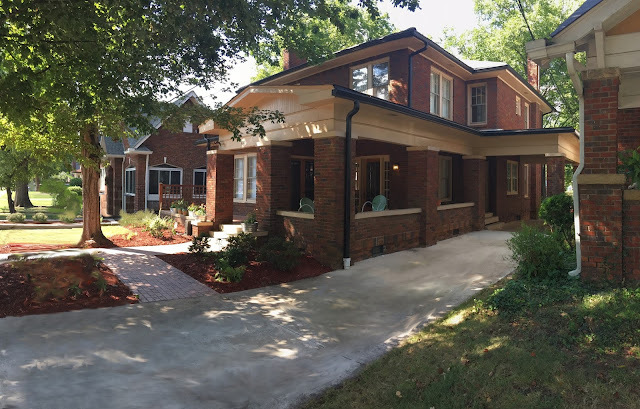 The landing effectively cordons off a distinct Owner's Suite that spans the entire west side of the home. 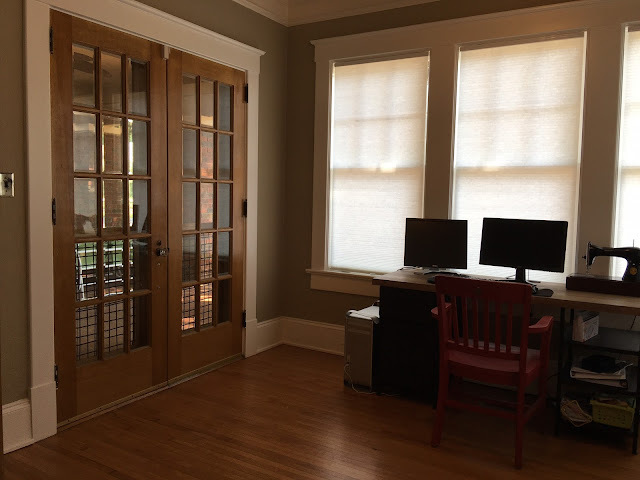 The Owner's Suite includes the large bedroom with masonry fireplace, leading through more French doors to a sitting room that current owners used as a home office. 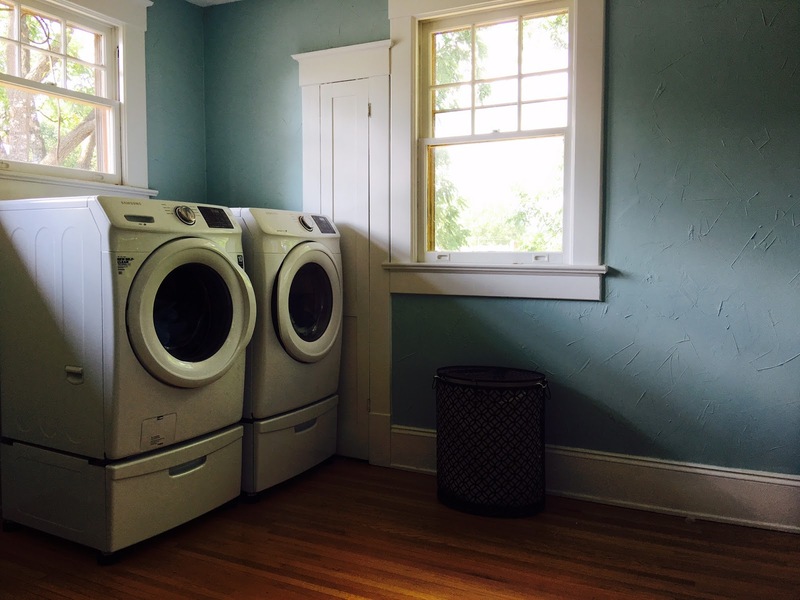 Another small bonus room could be dressing area or walk-in closet, and leads to a bright and airy upstairs laundry room with more built-in cupboards. The remaining two bedrooms also offer walk-in closets (one is large enough to have been used as a cute playroom!) and stream with natural light through beautiful large windows. 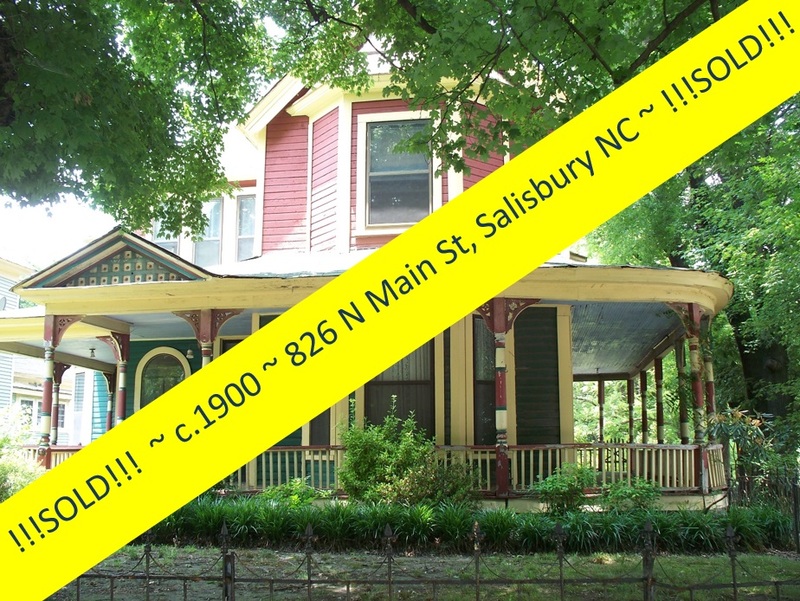 Absolutely nothing needs to be done to this beautiful home ~ just call the movers! 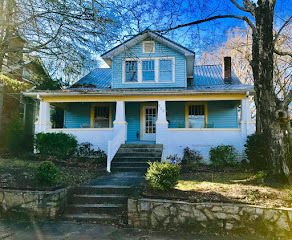 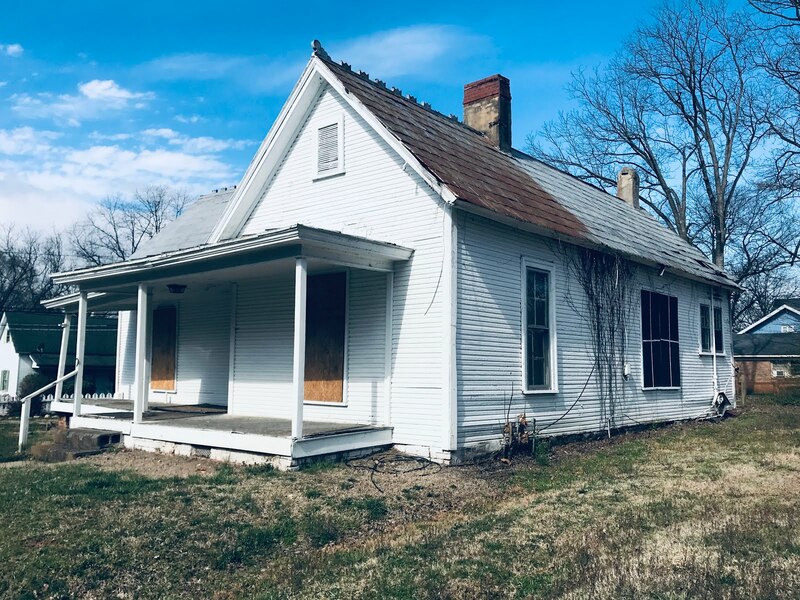 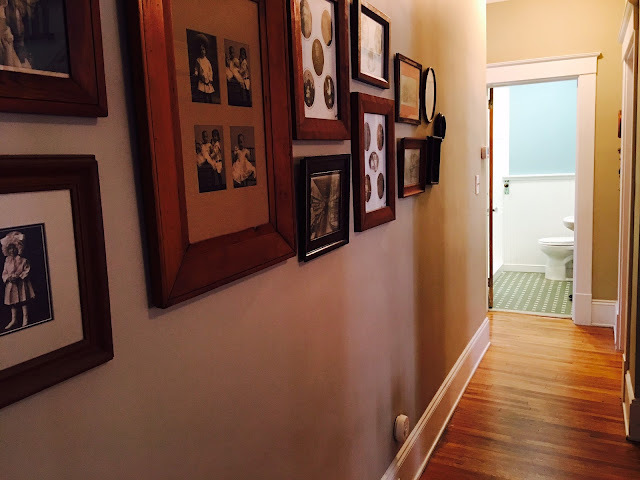 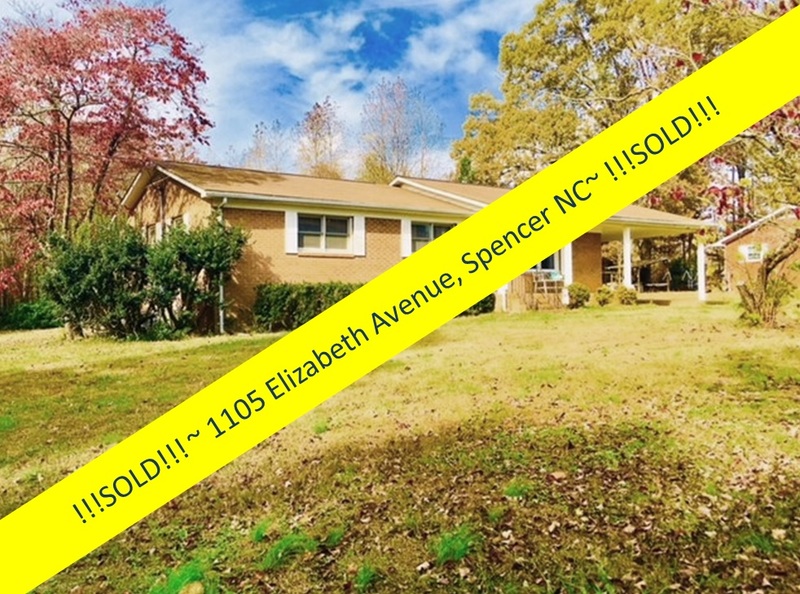 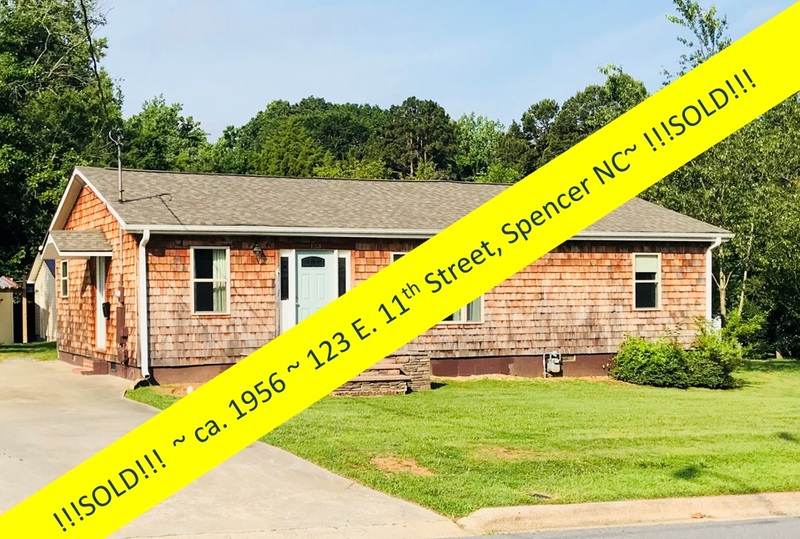 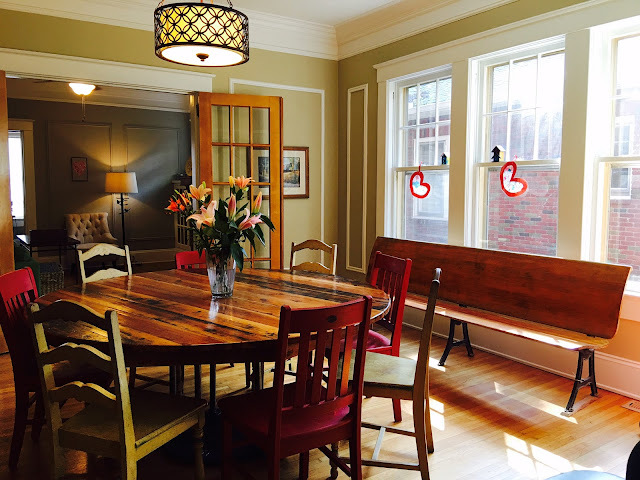 Current owners invested in many updates: All plumbing, previously cast iron, has been replaced, the downstairs bath completely renovated, the custom kitchen banquette is new, new HVAC, new attic fan, and new terra cotta tiles on the front porch. The driveway is newly poured concrete. 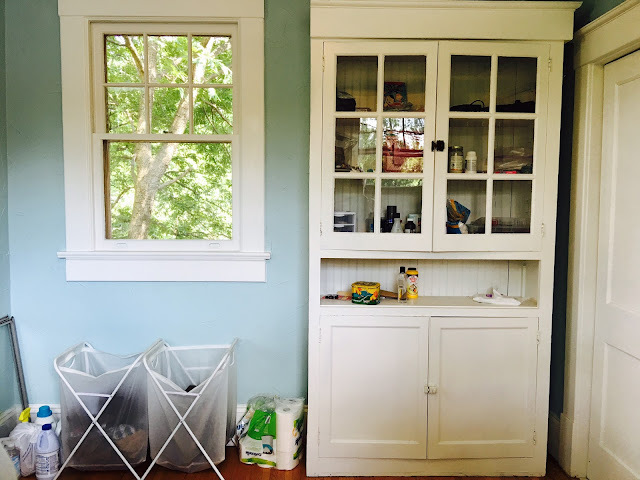 An unfinished basement is perfect for a workshop! 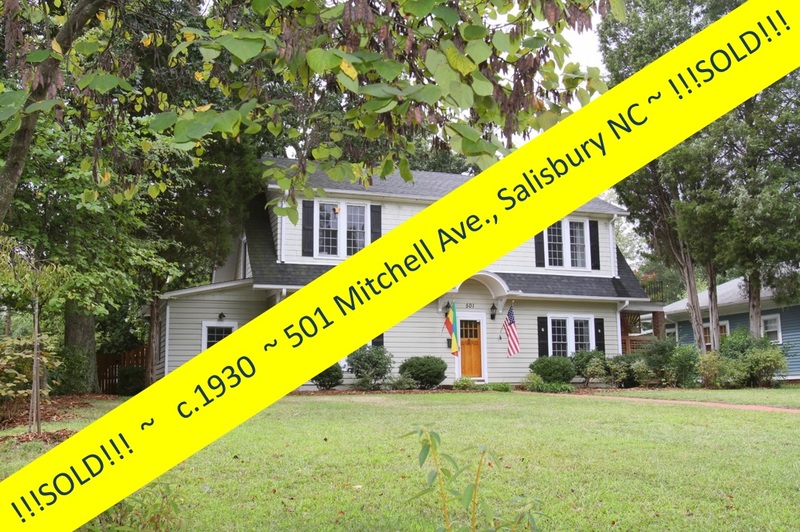 You've heard the 'must-see' phrase many a time, we're sure... but really...this fabulous home and its many details are best seen in person. 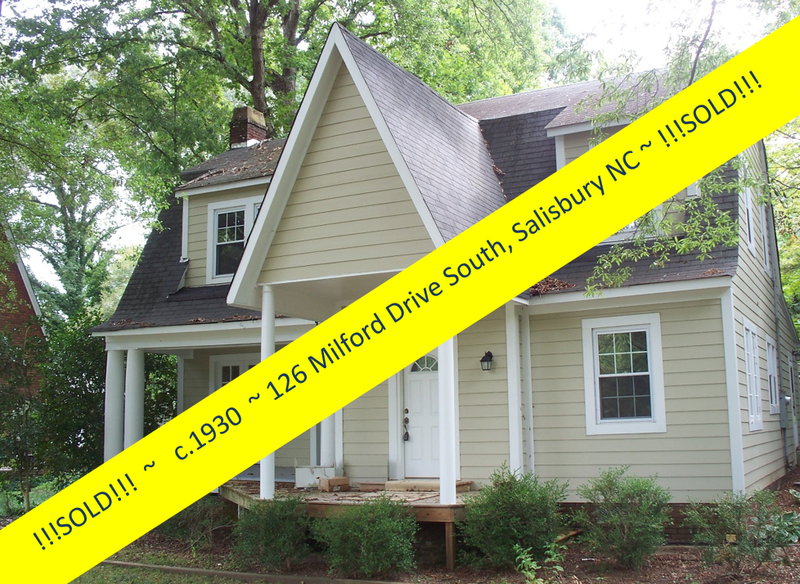 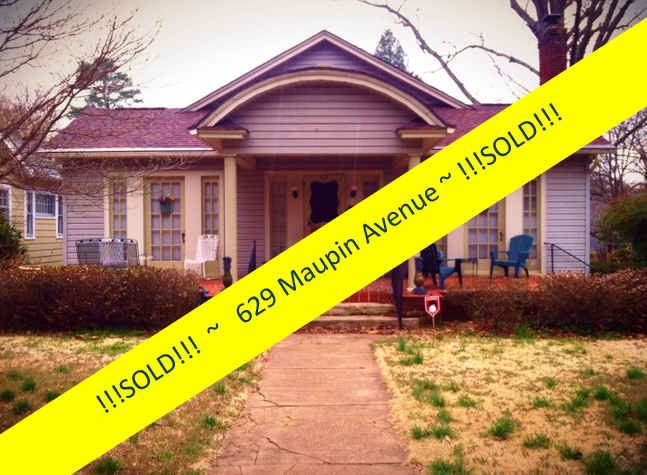 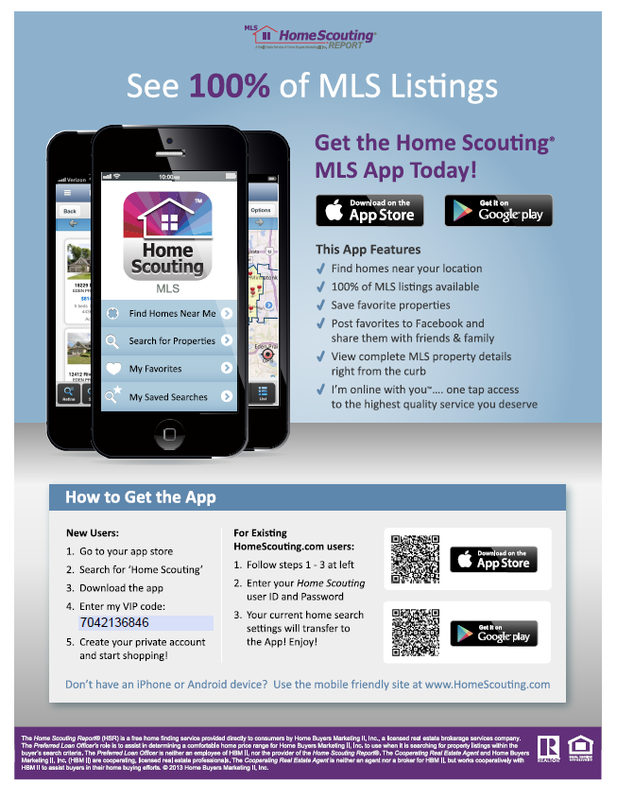 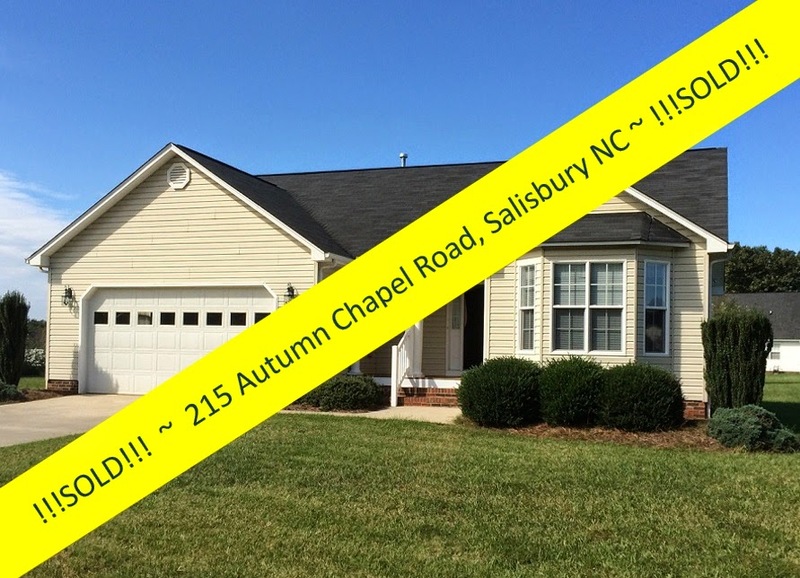 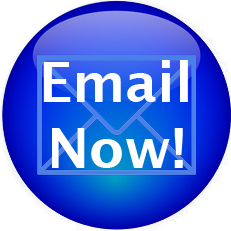 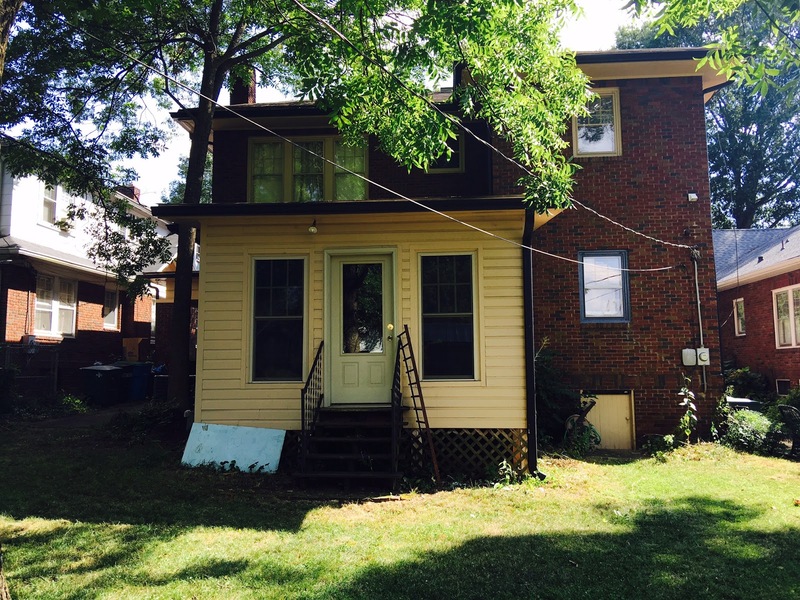 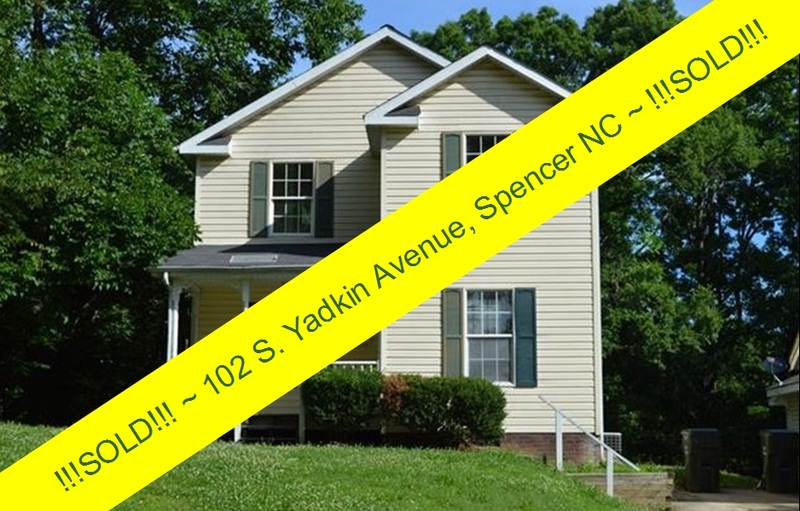 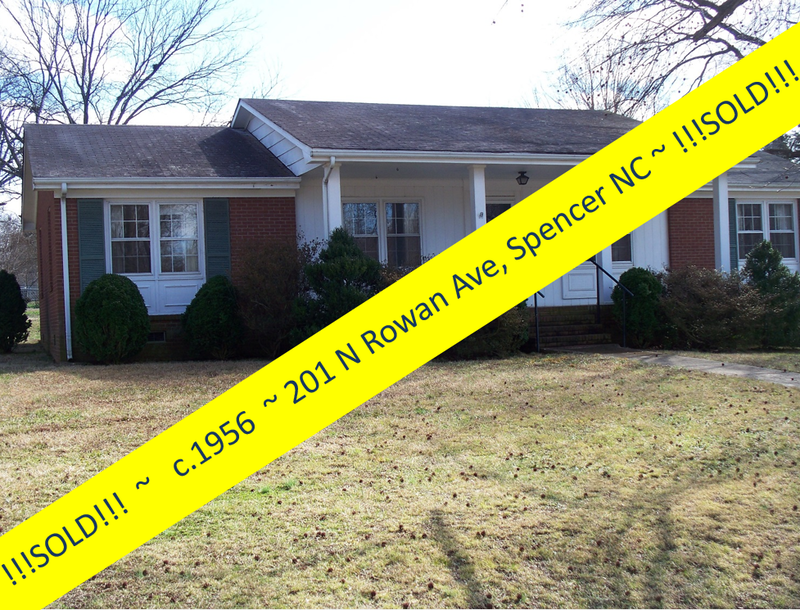 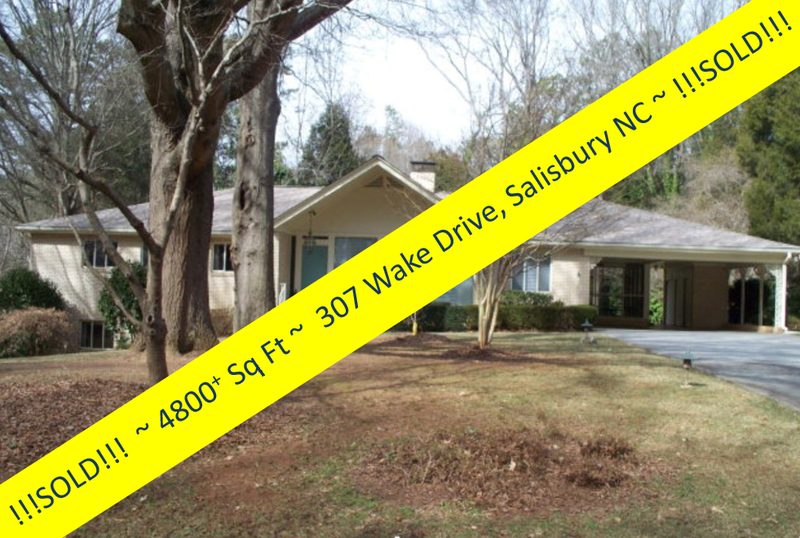 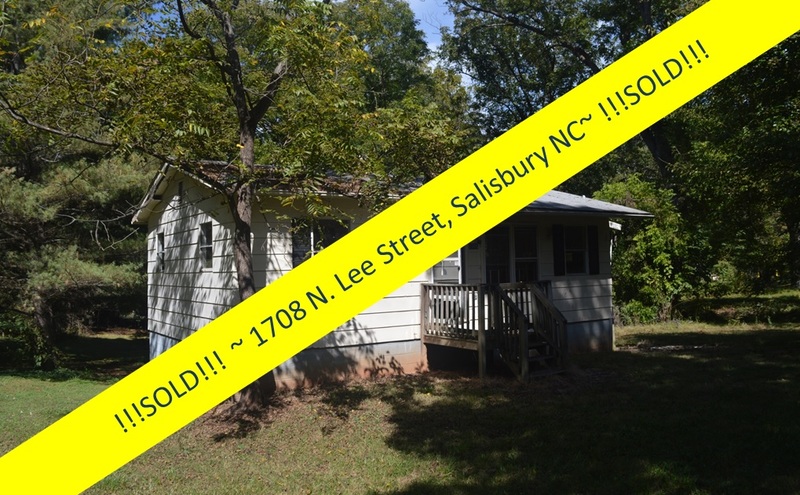 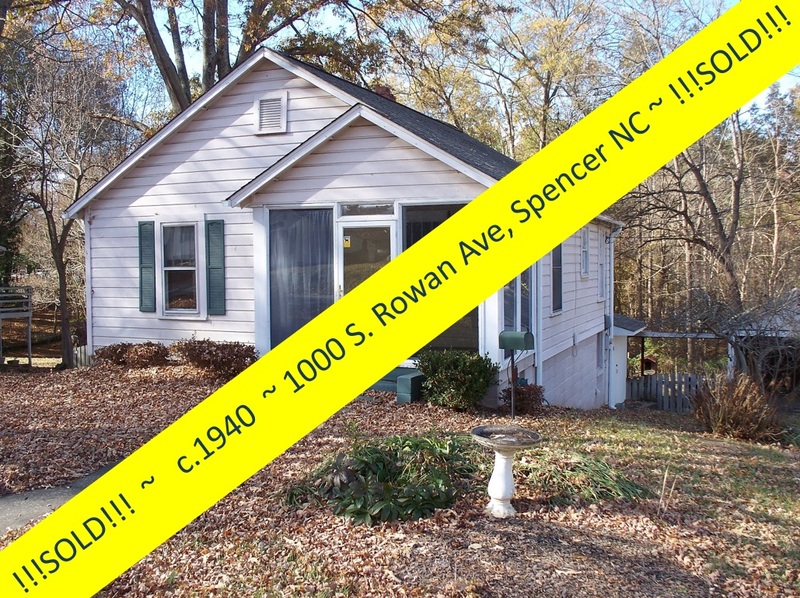 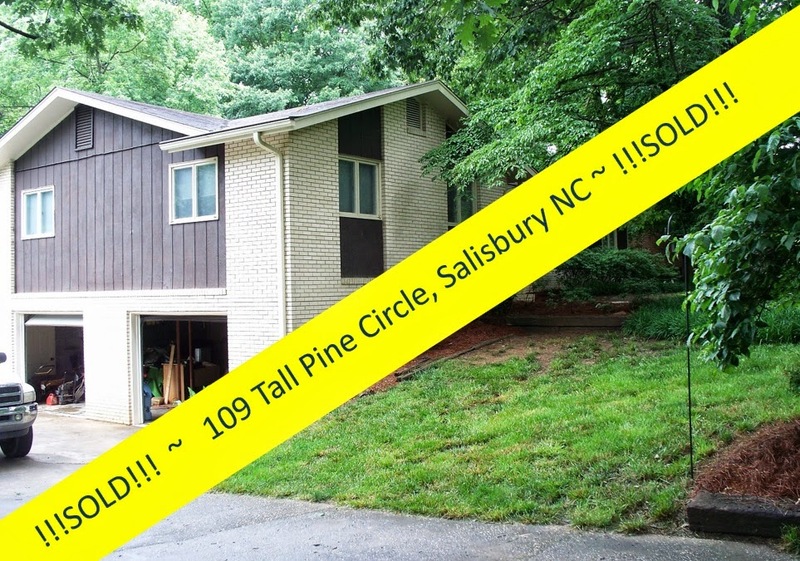 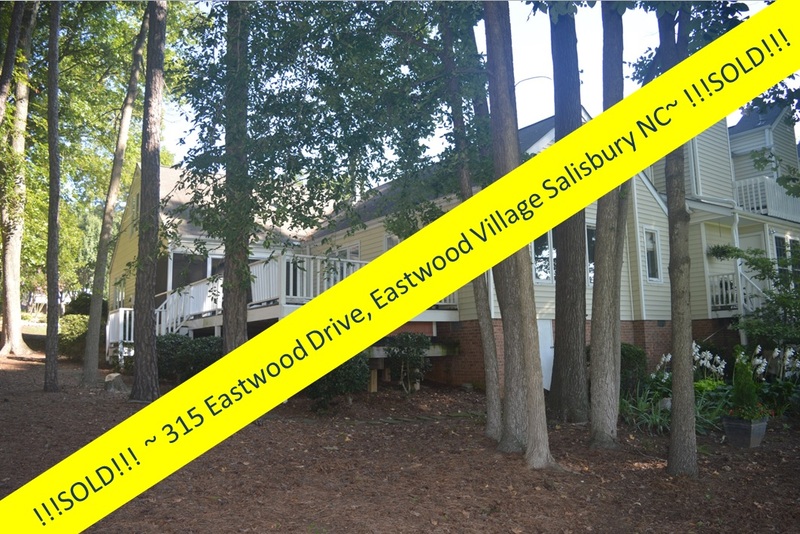 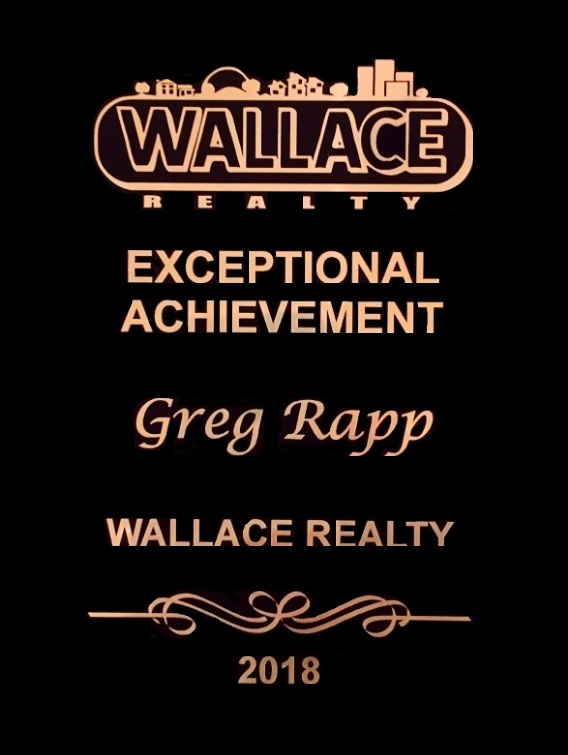 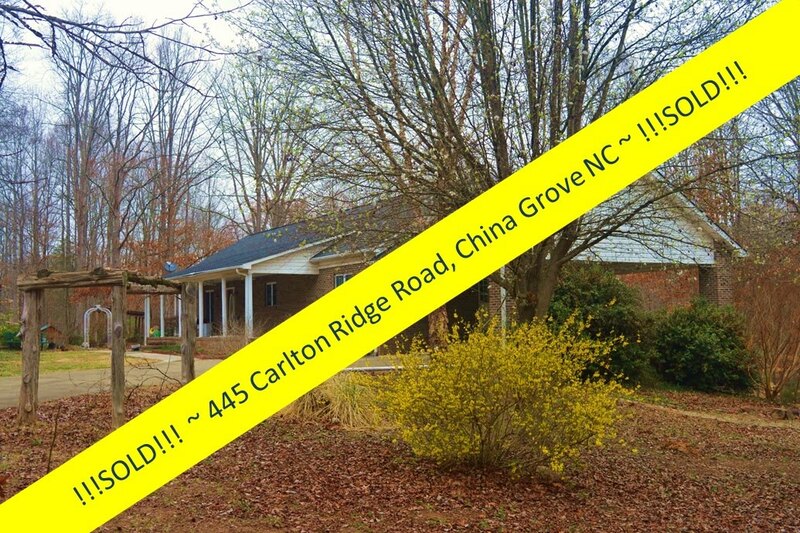 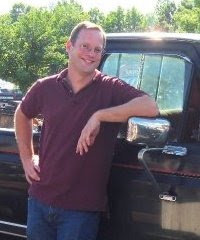 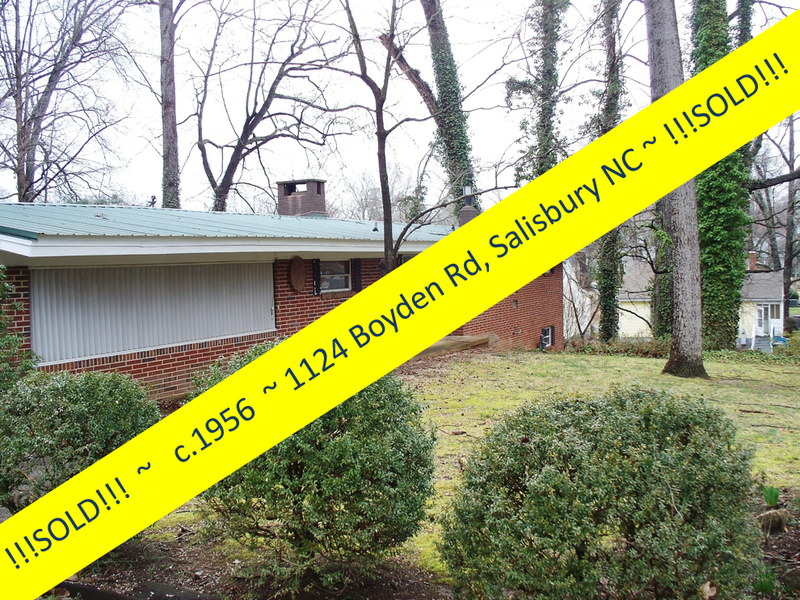 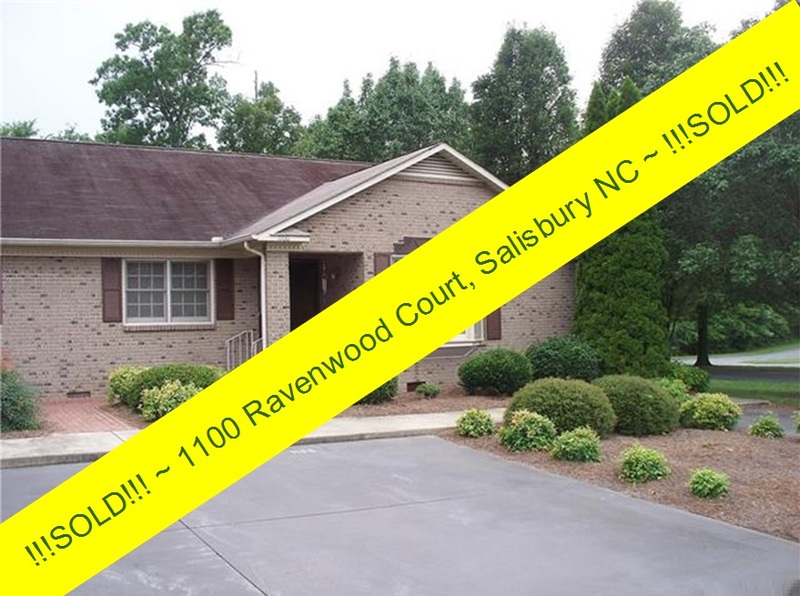 Make an appointment with Greg Rapp, (704) 213-6846, for a showing.